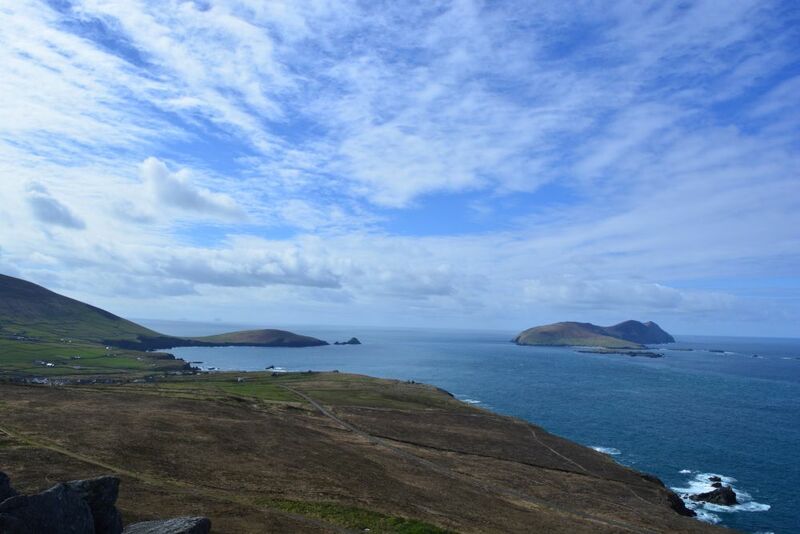 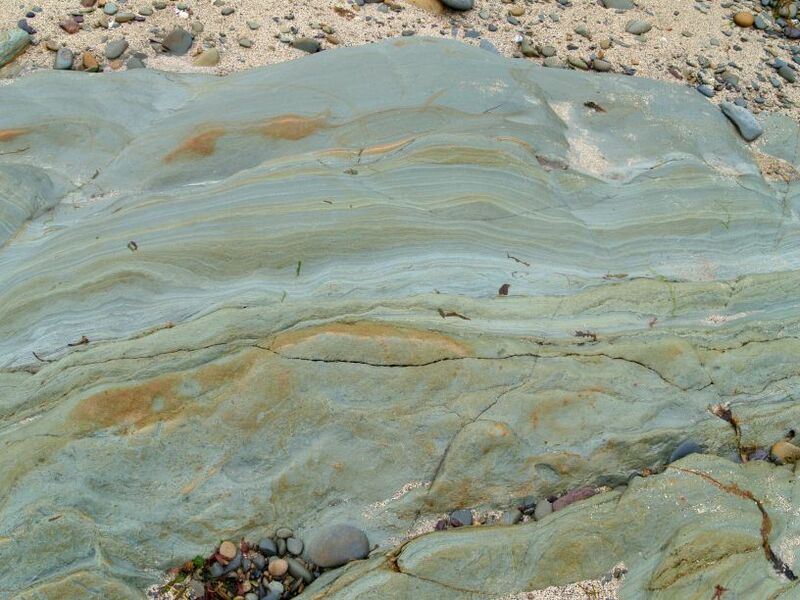 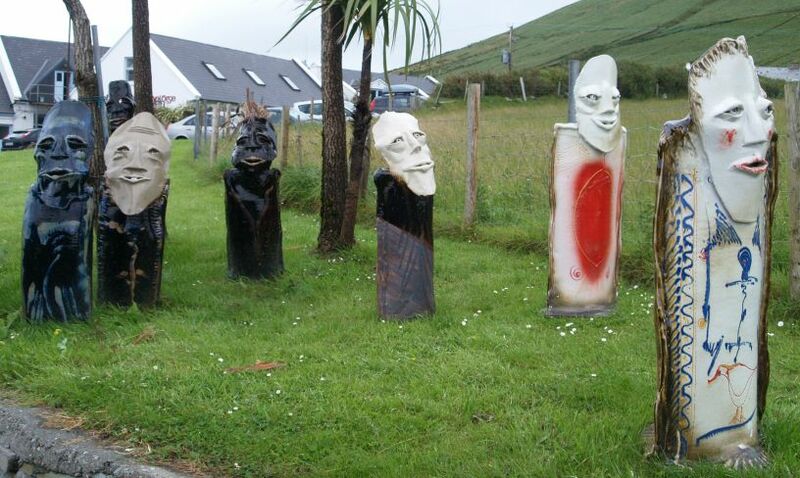 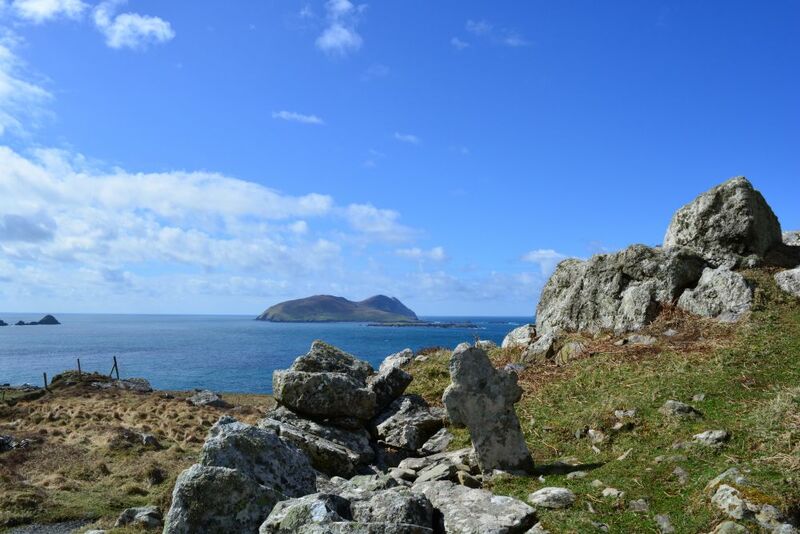 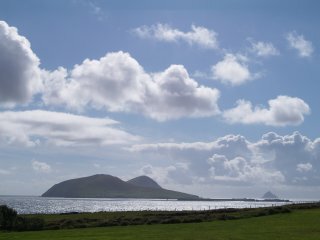 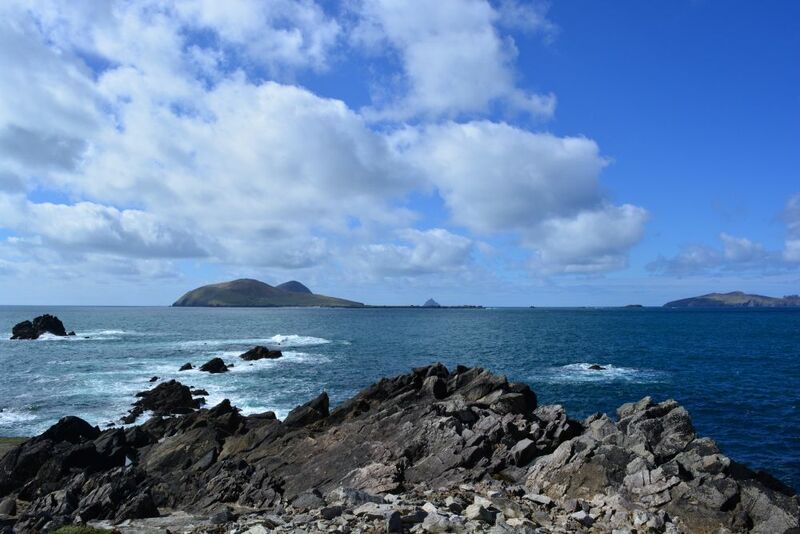 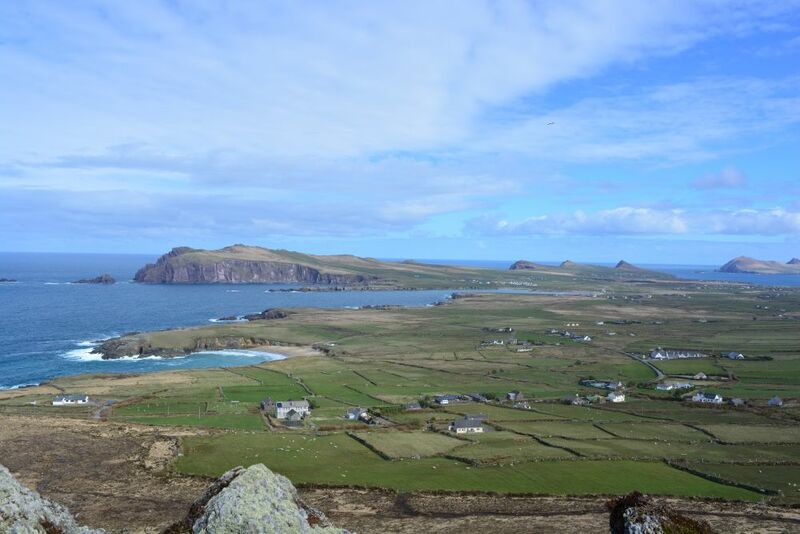 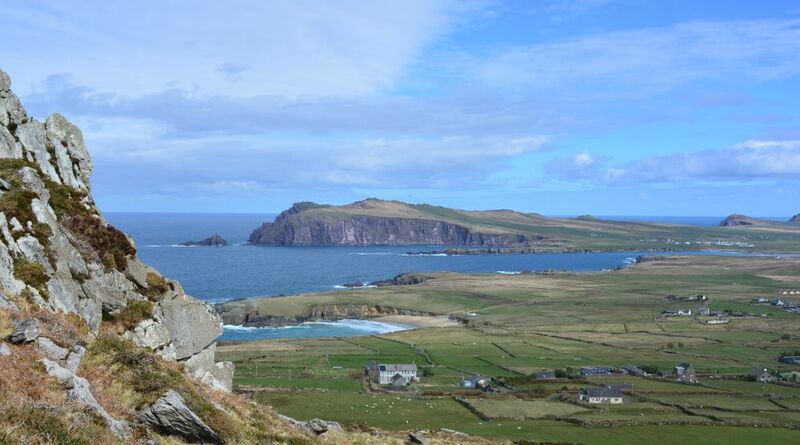 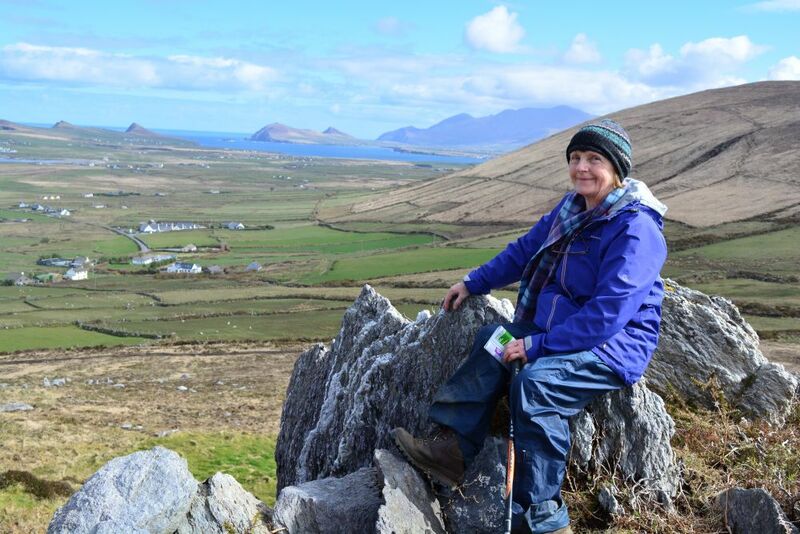 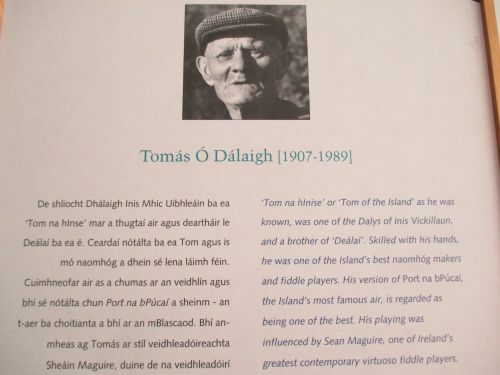 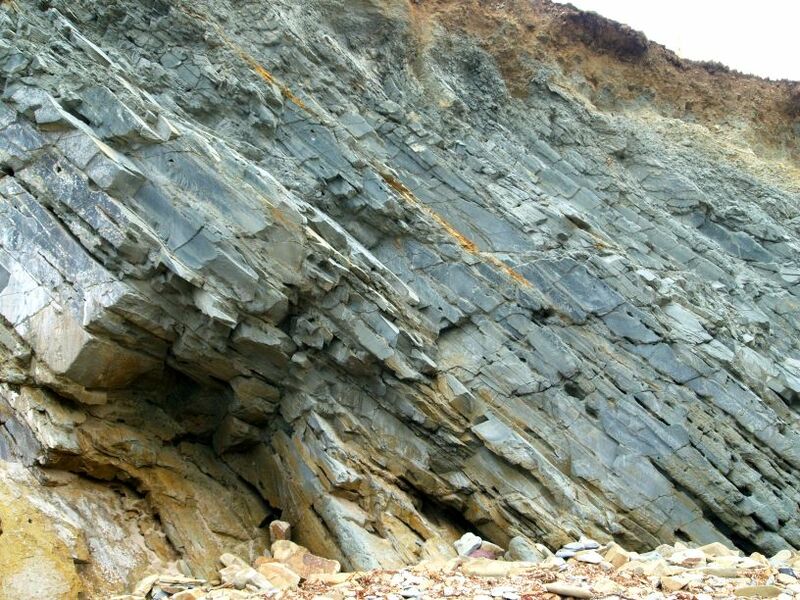 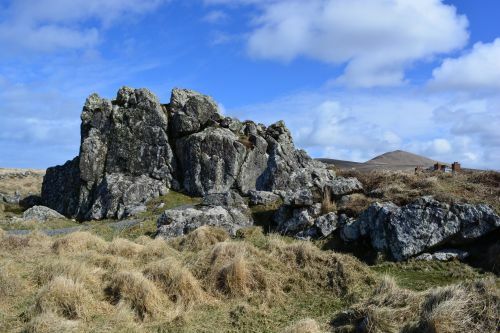 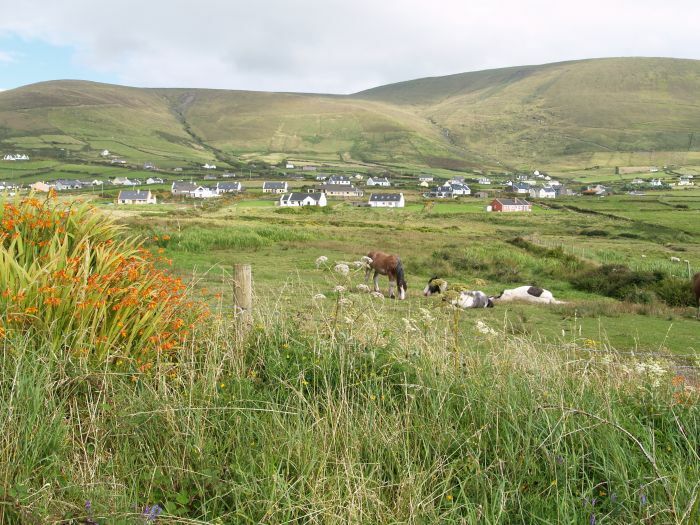 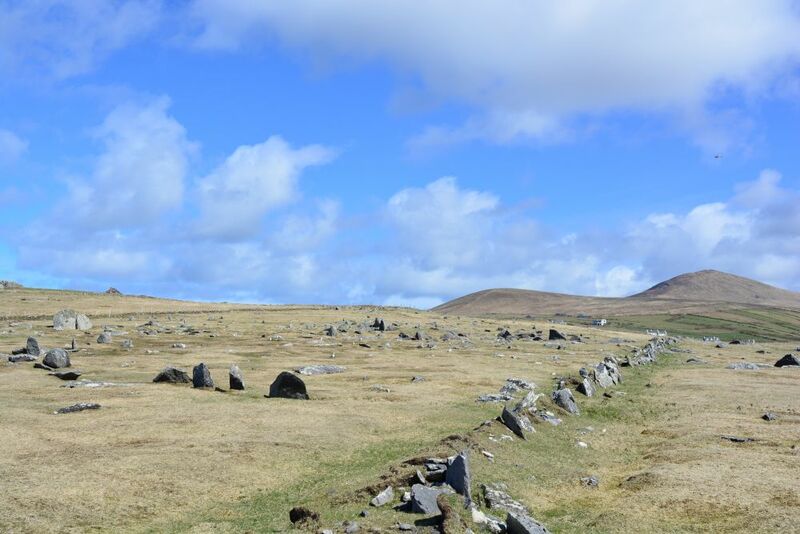 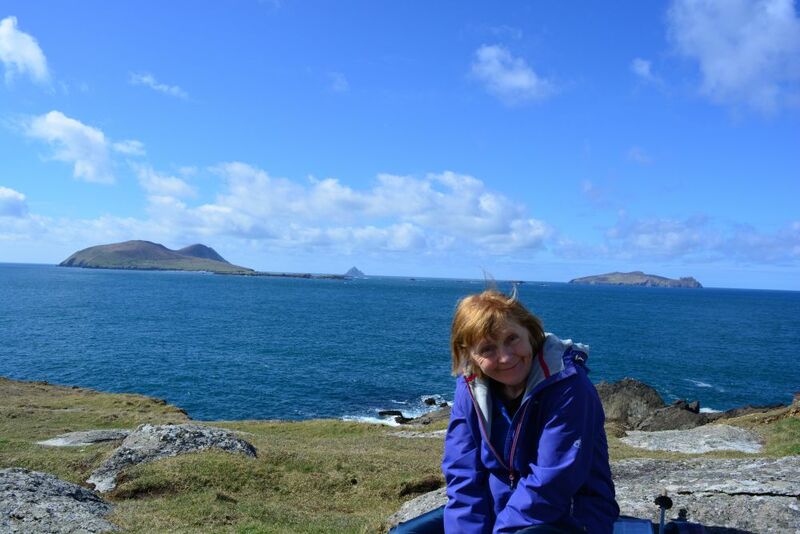 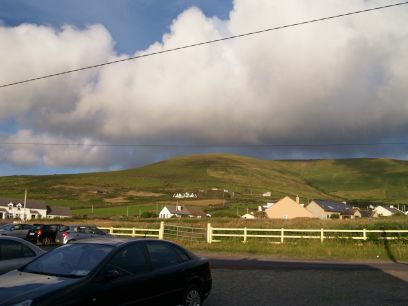 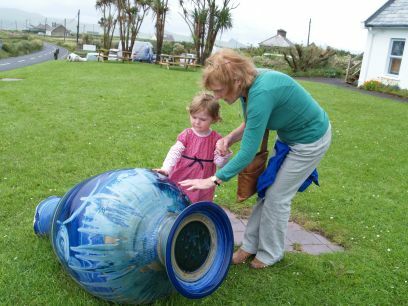 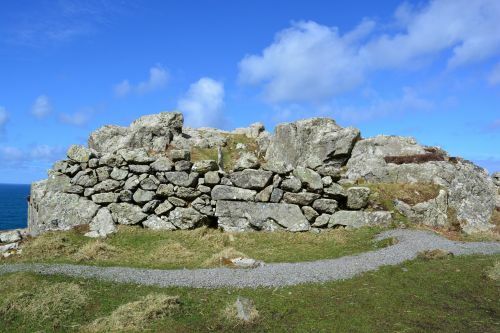 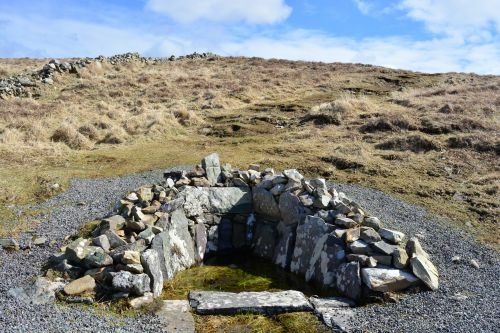 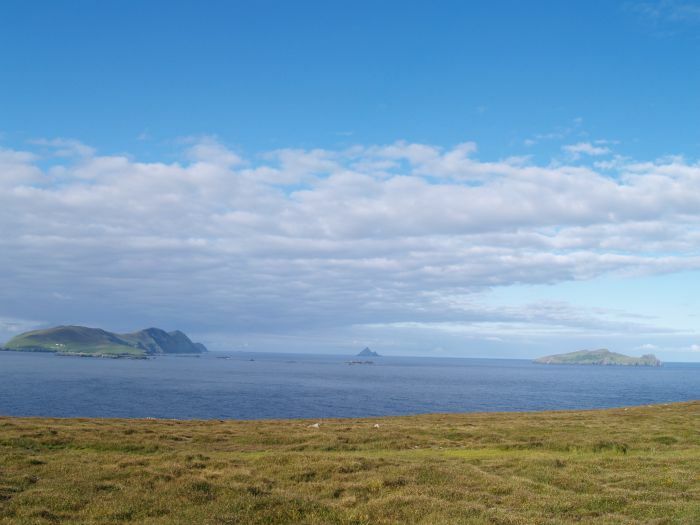 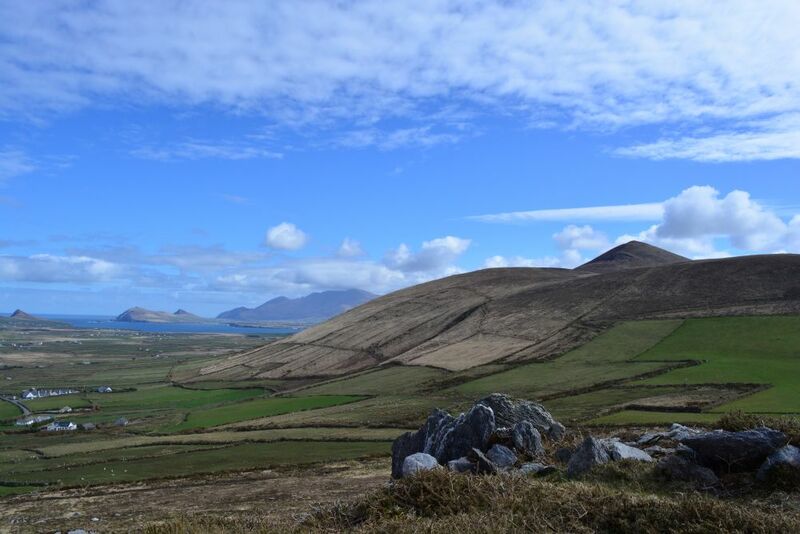 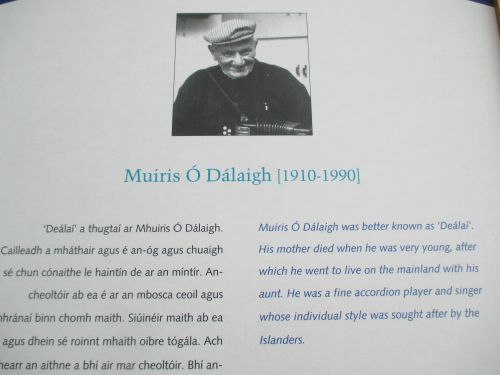 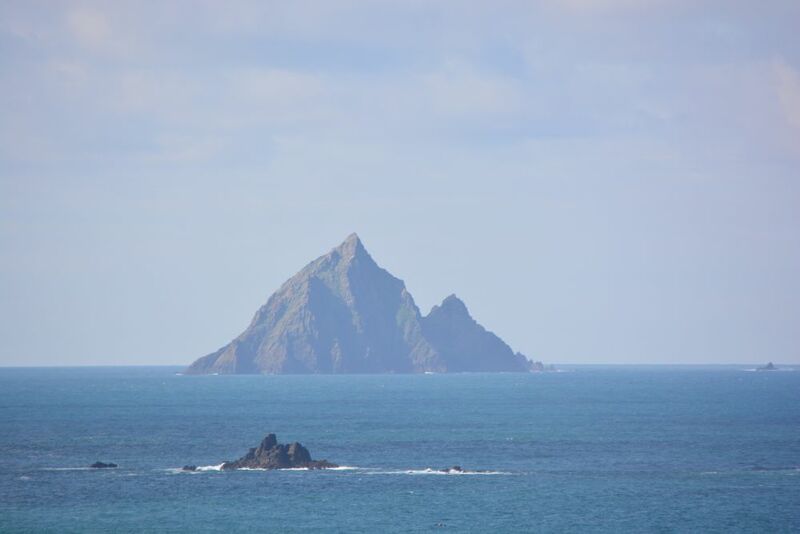 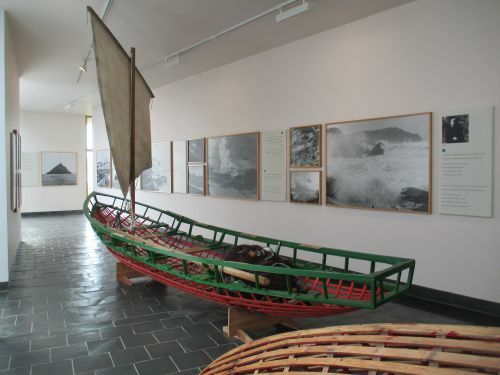 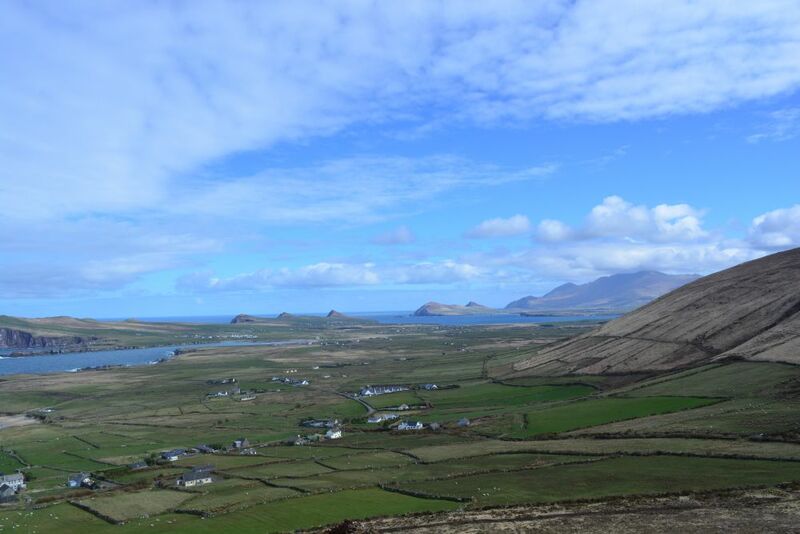 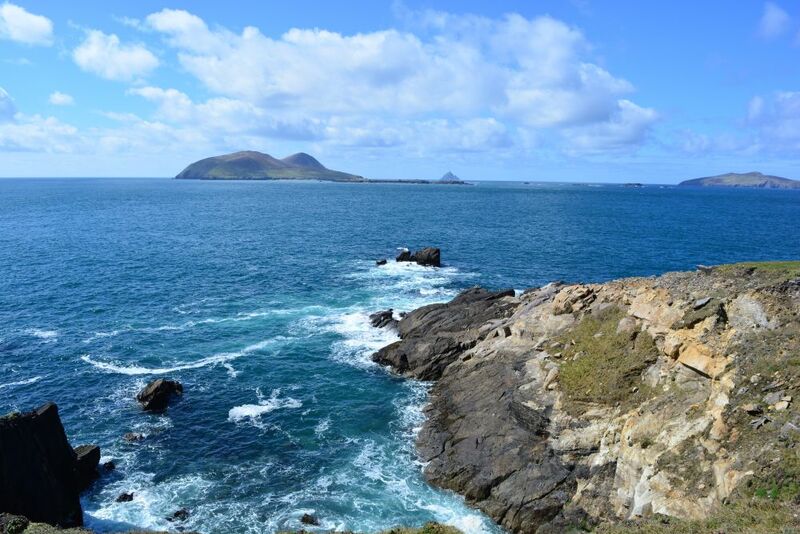 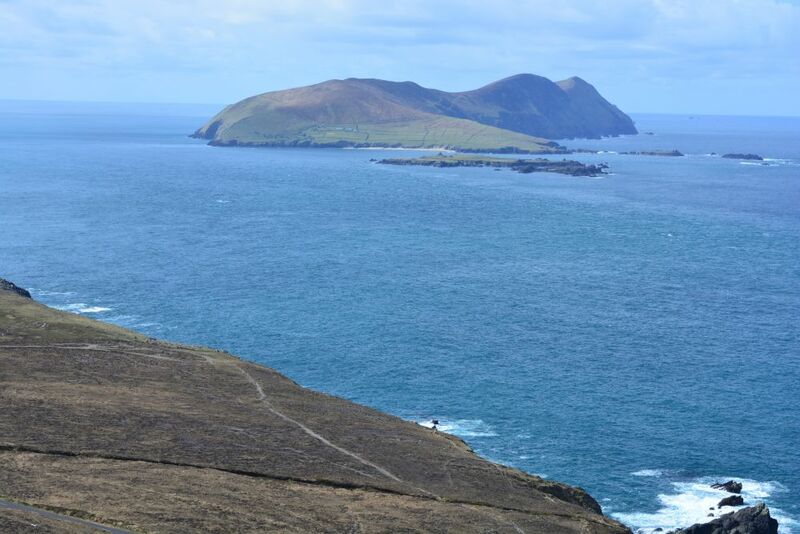 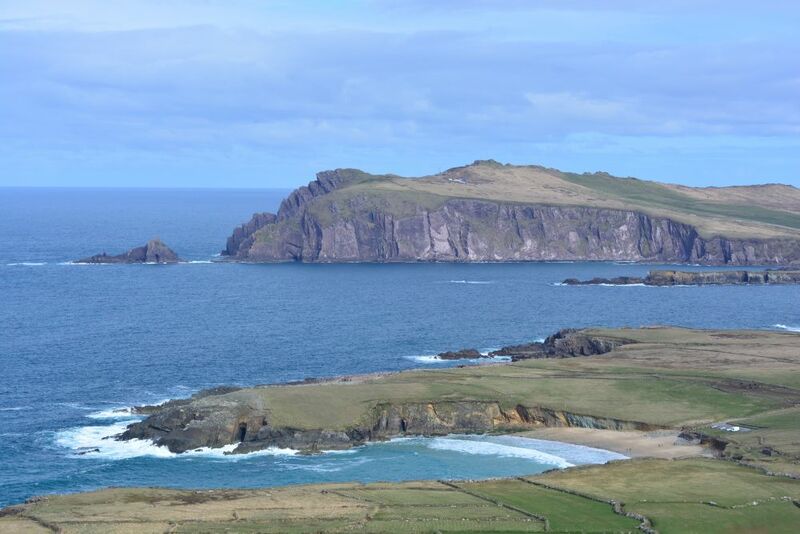 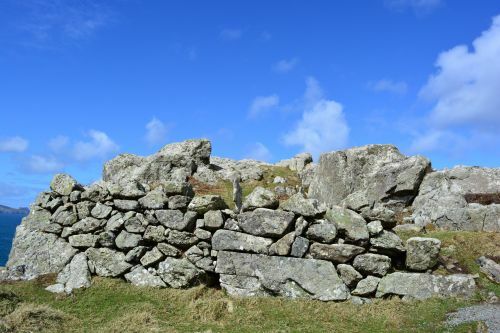 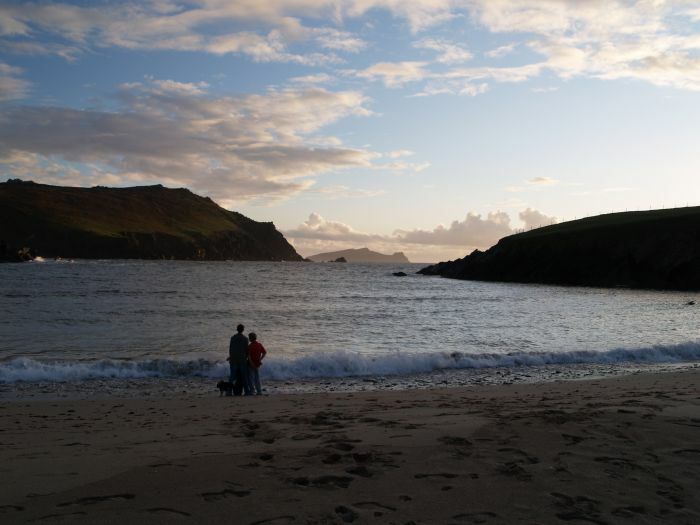 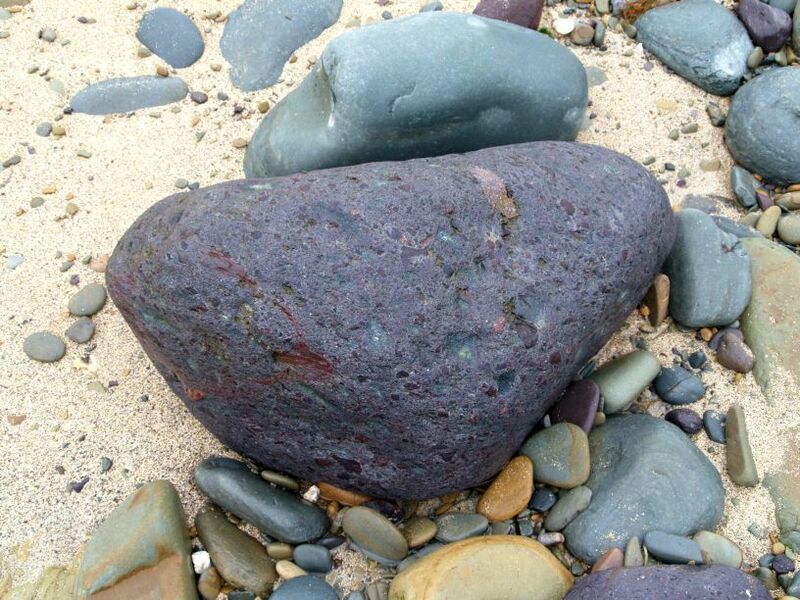 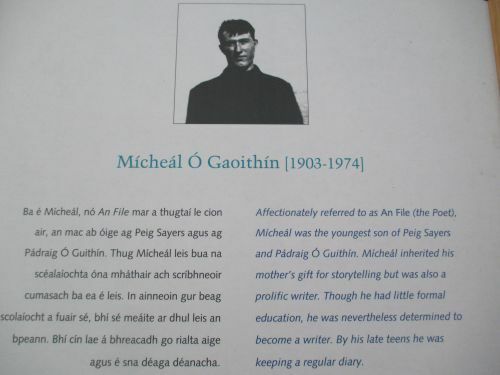 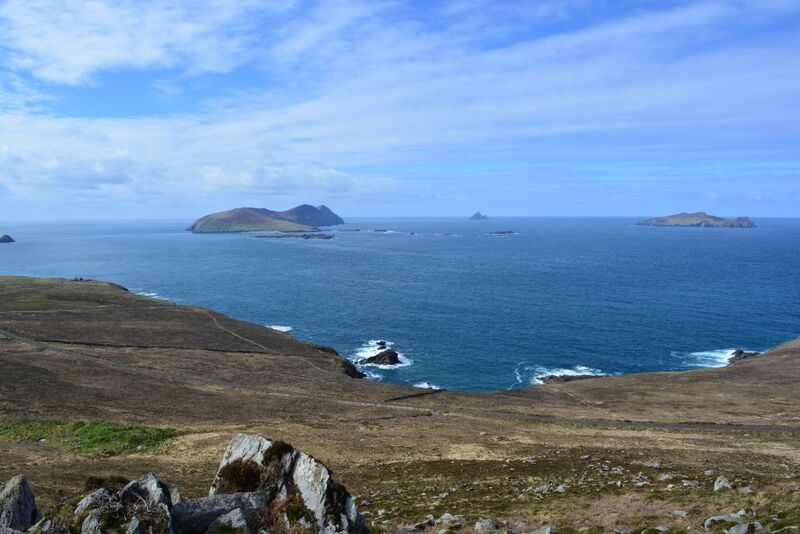 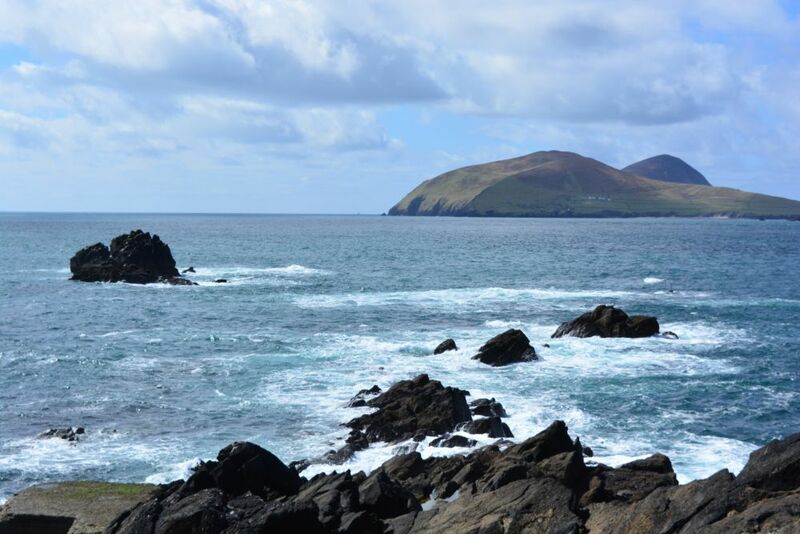 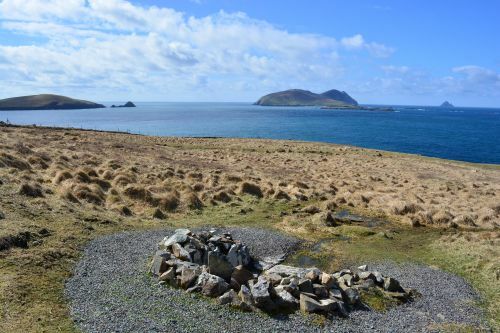 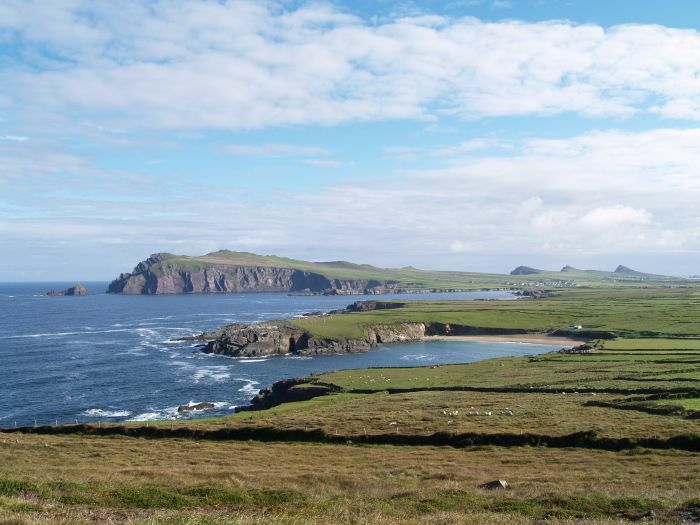 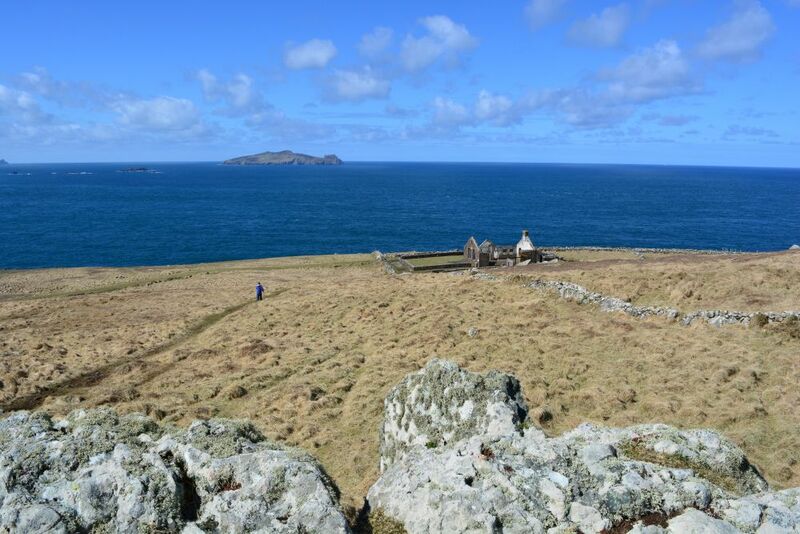 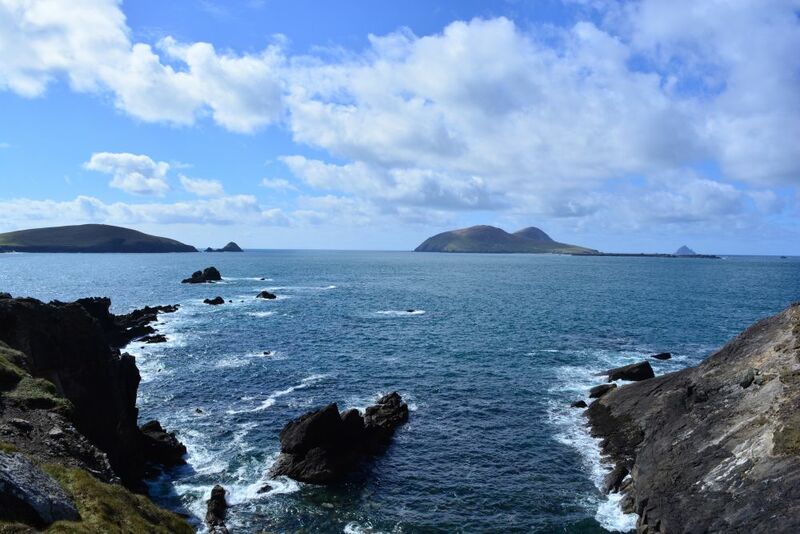 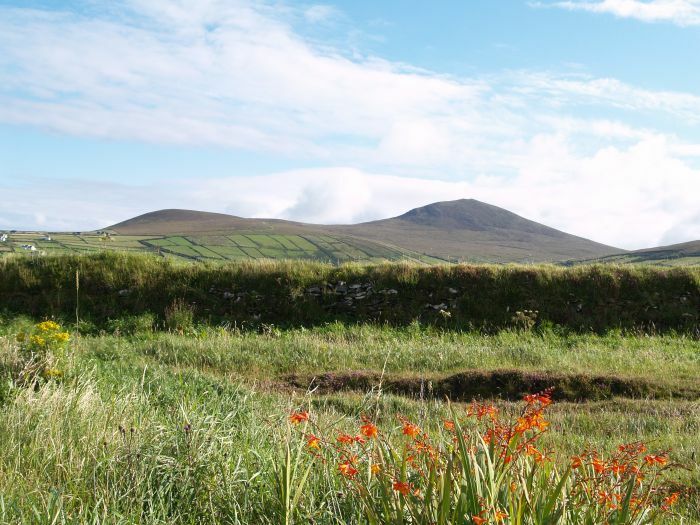 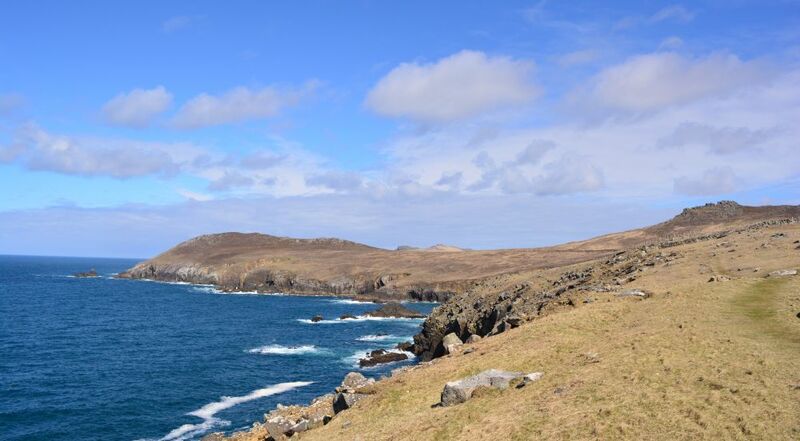 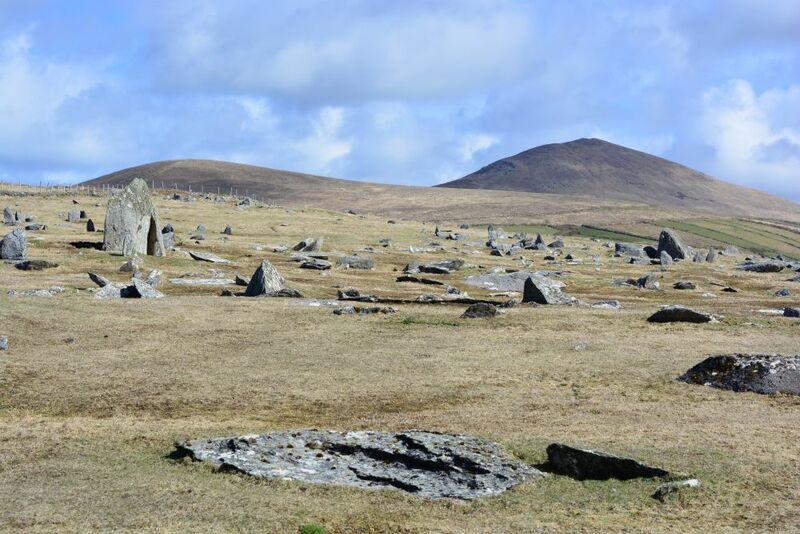 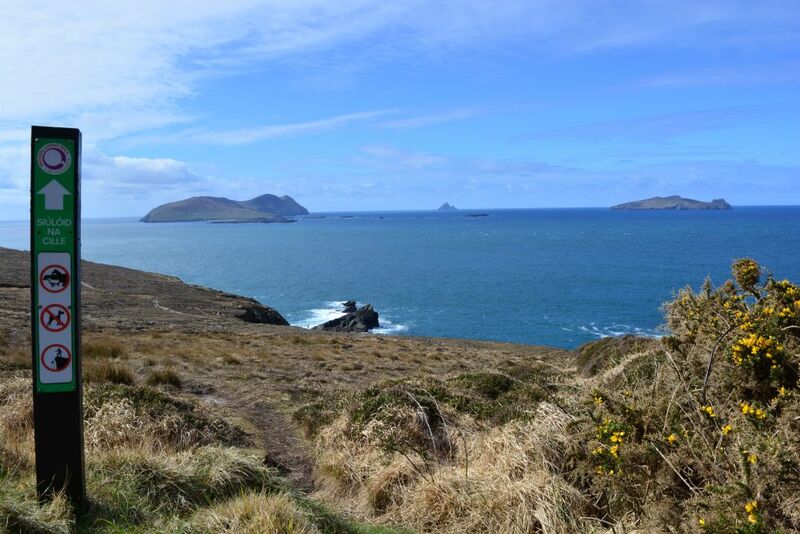 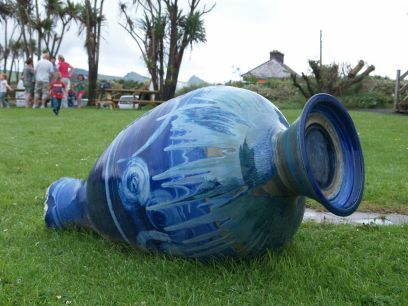 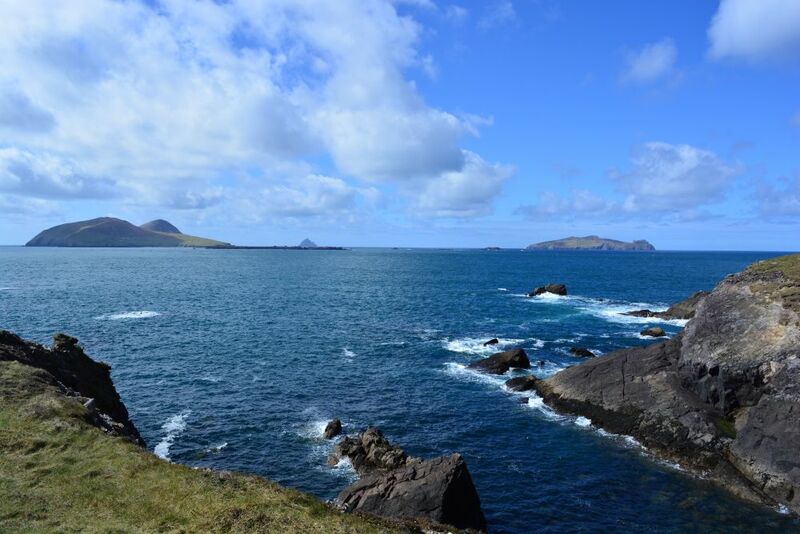 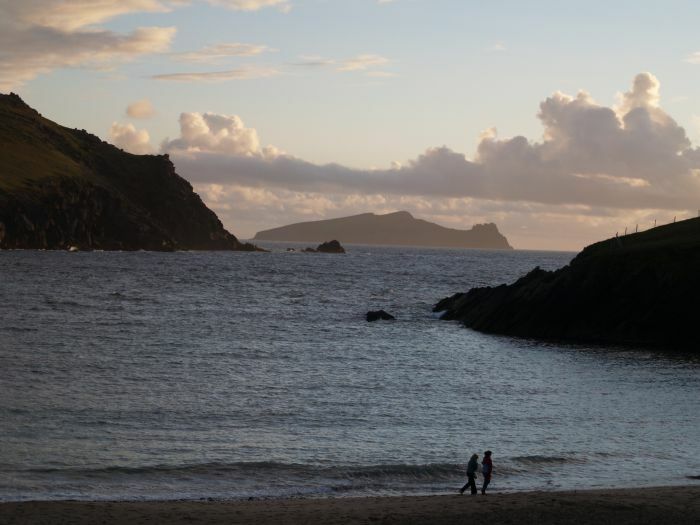 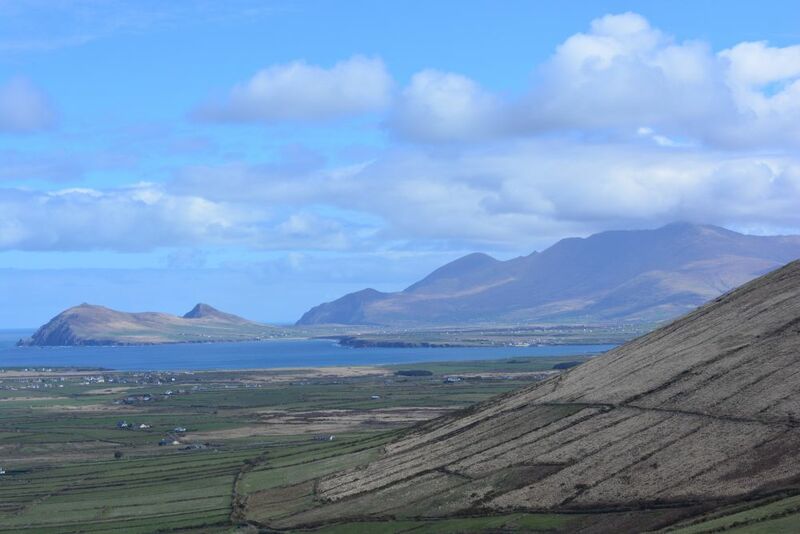 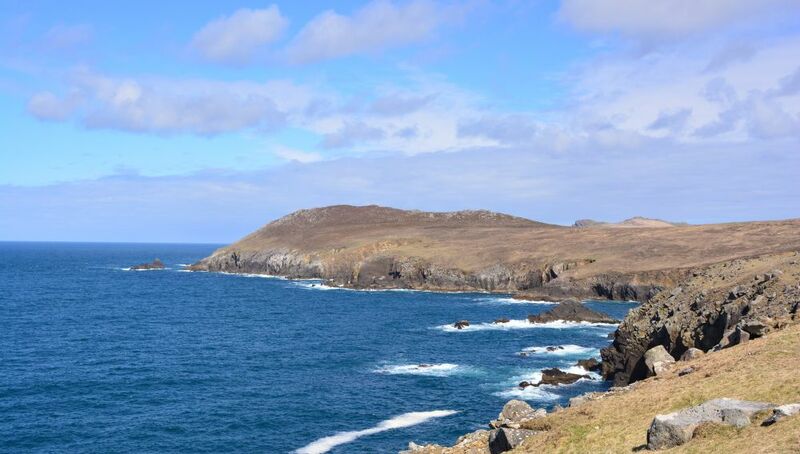 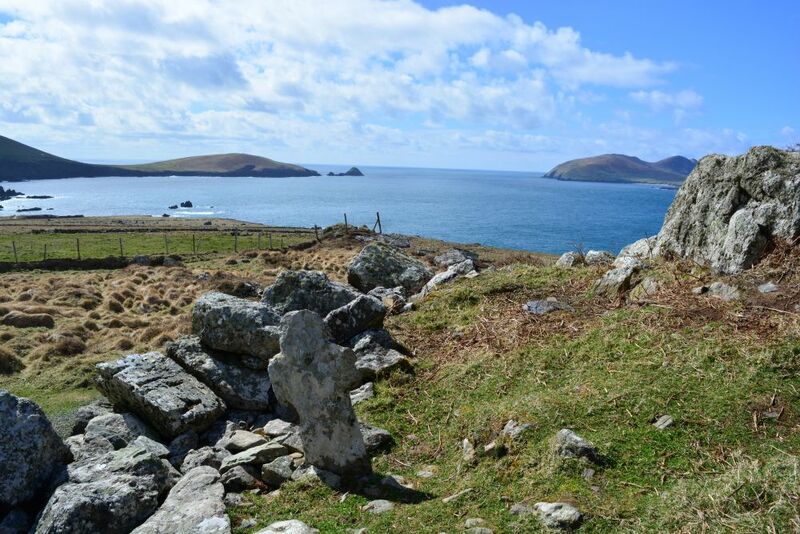 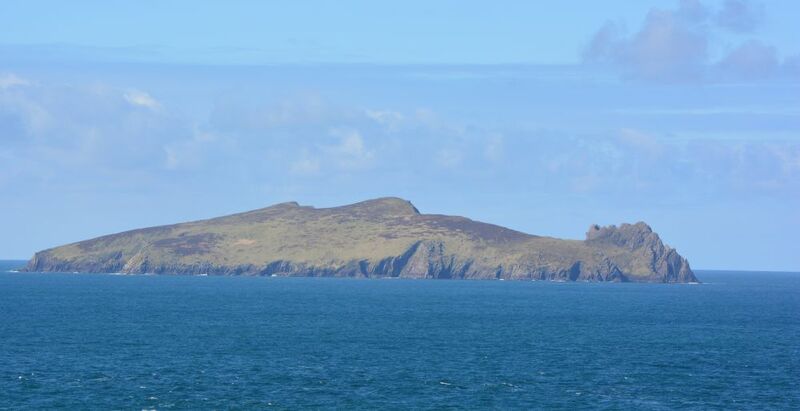 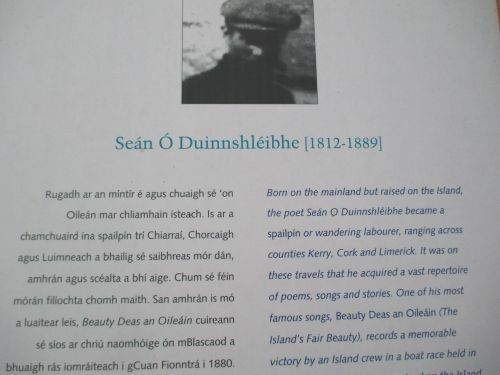 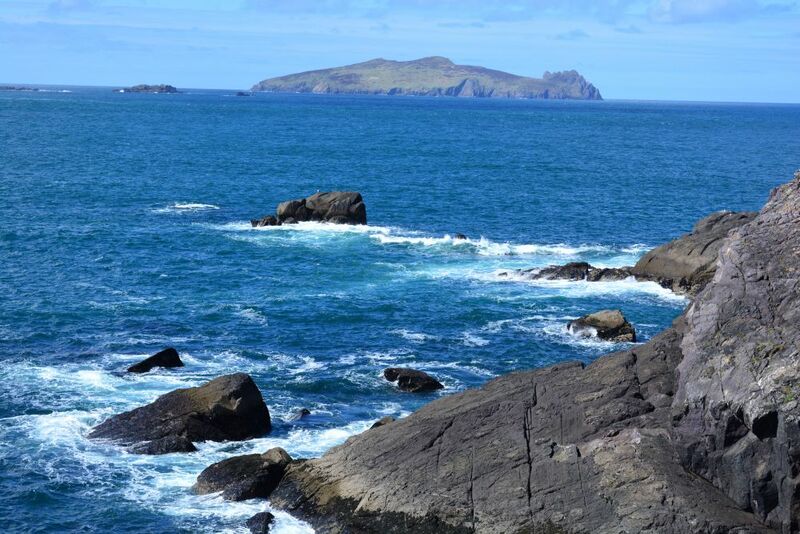 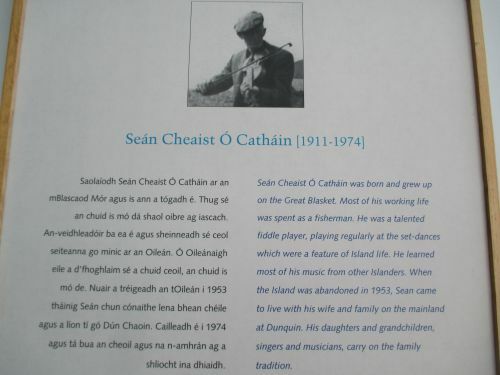 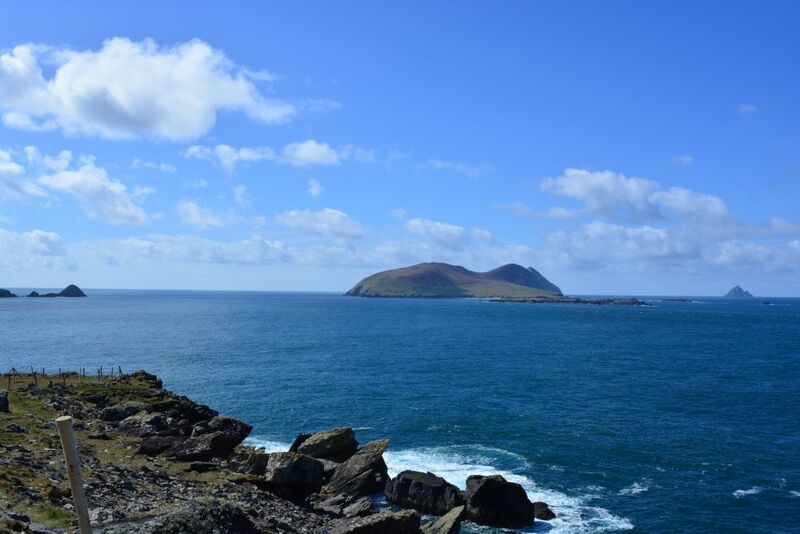 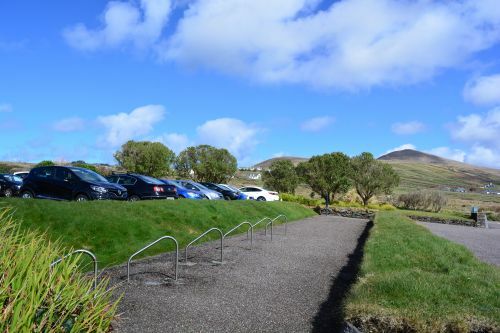 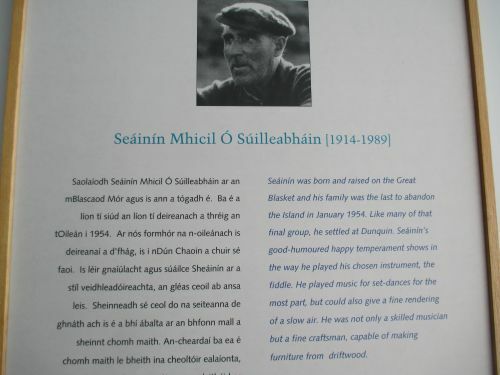 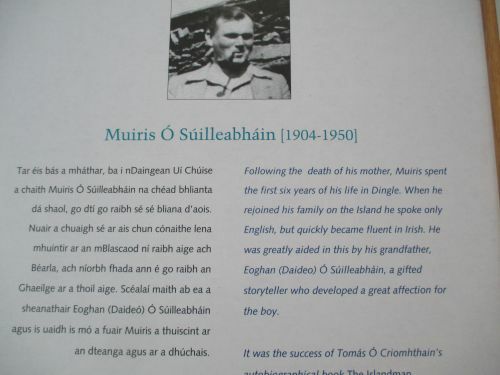 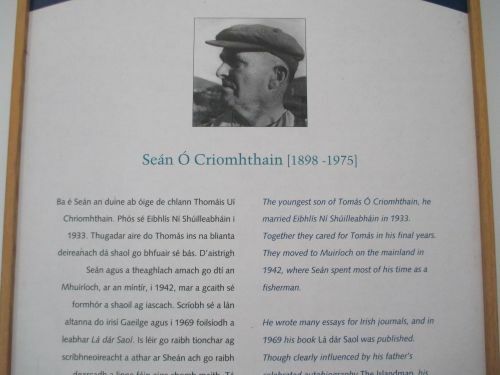 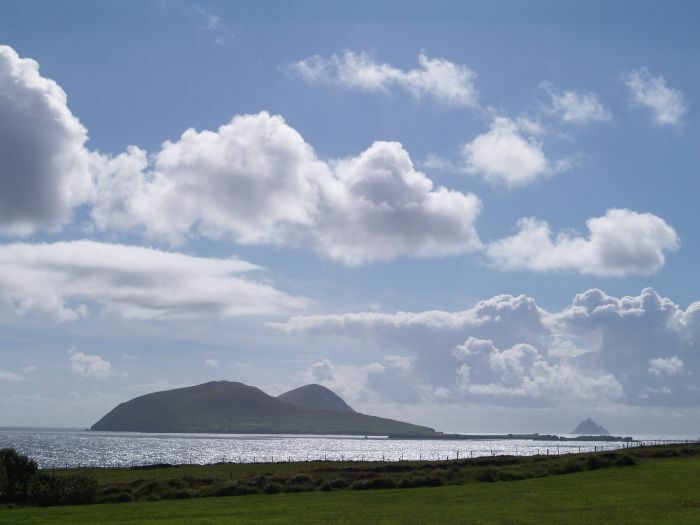 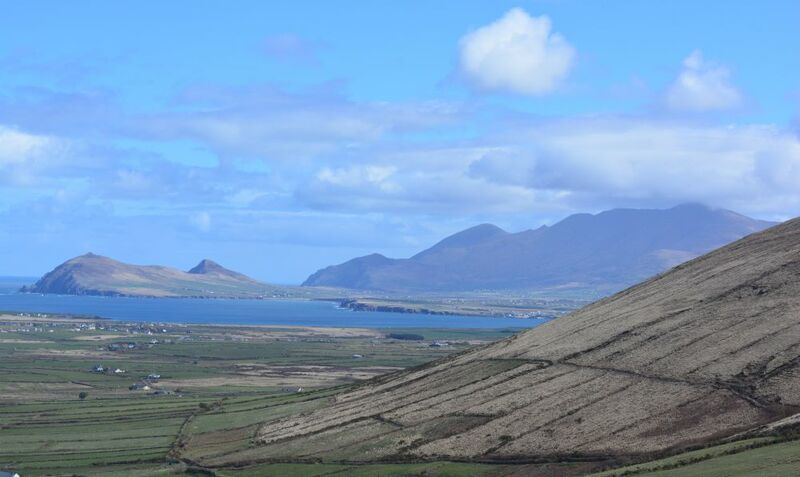 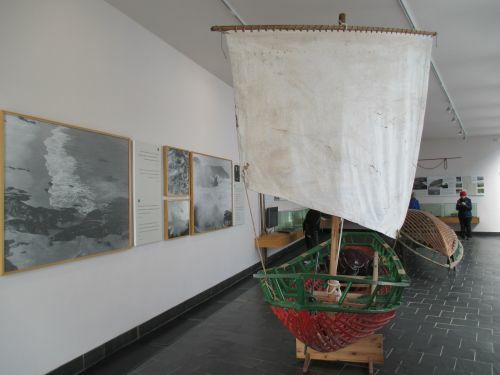 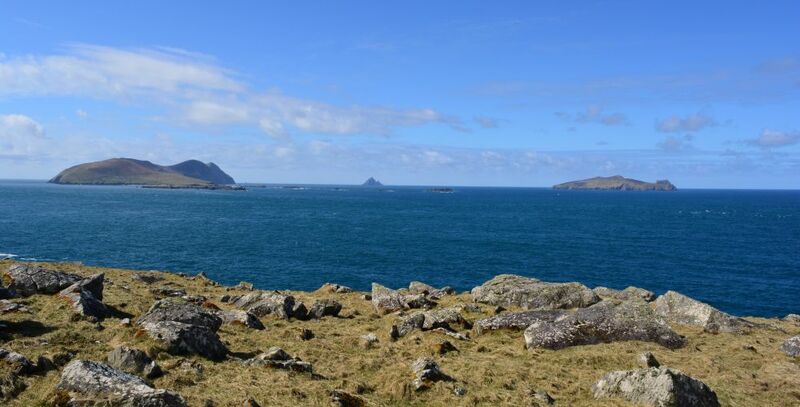 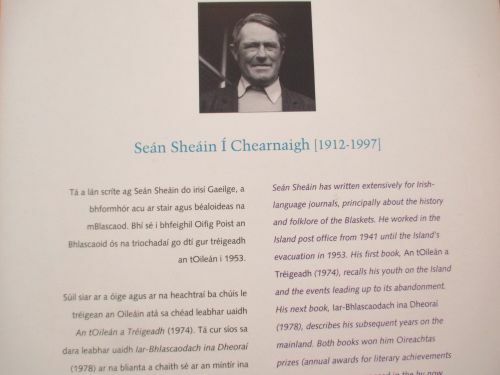 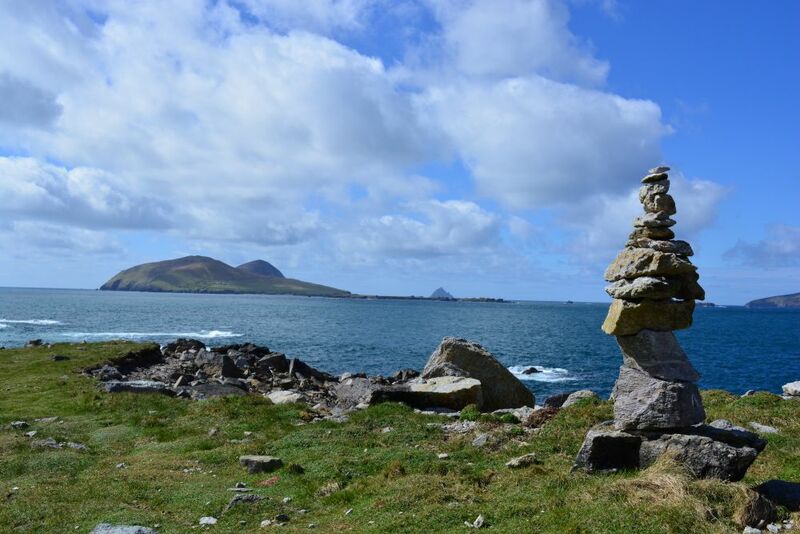 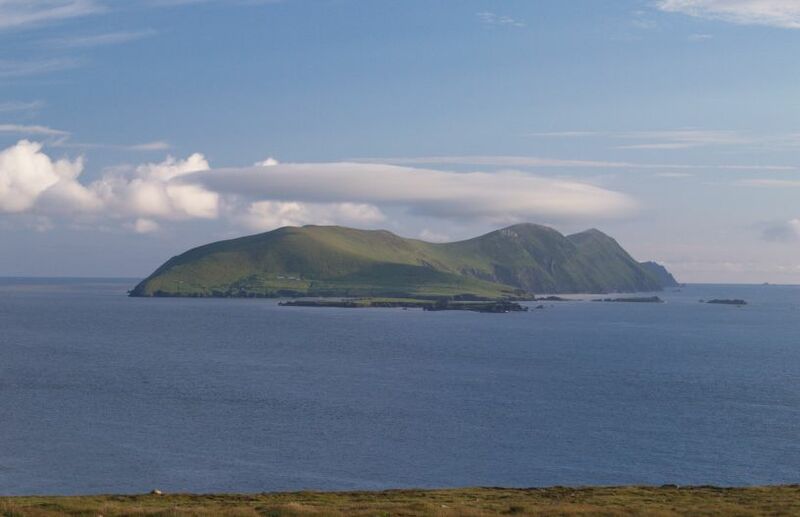 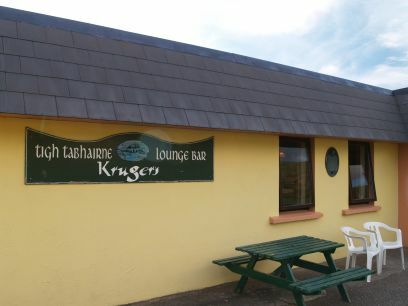 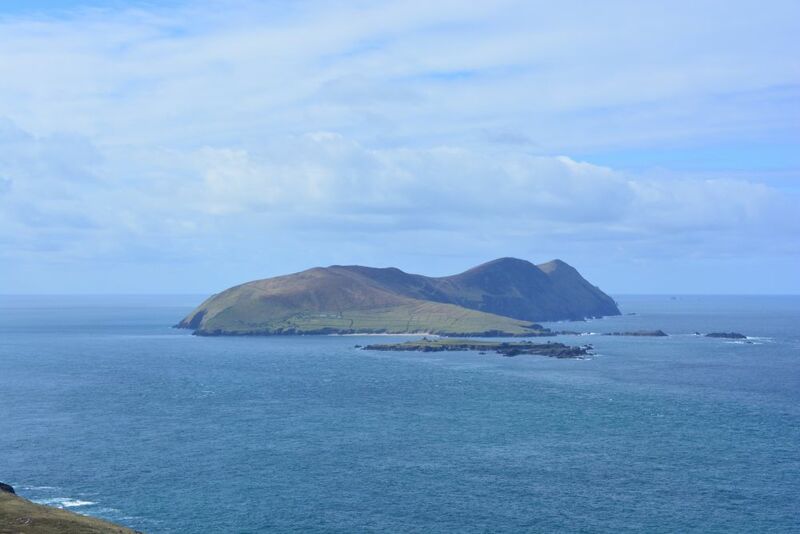 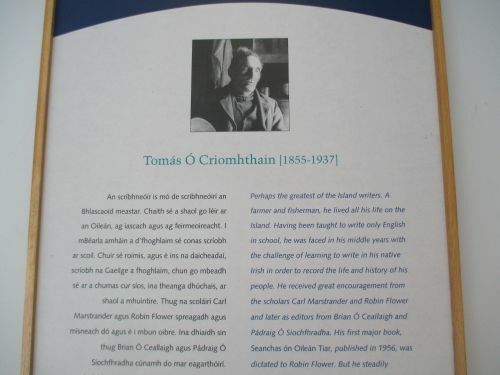 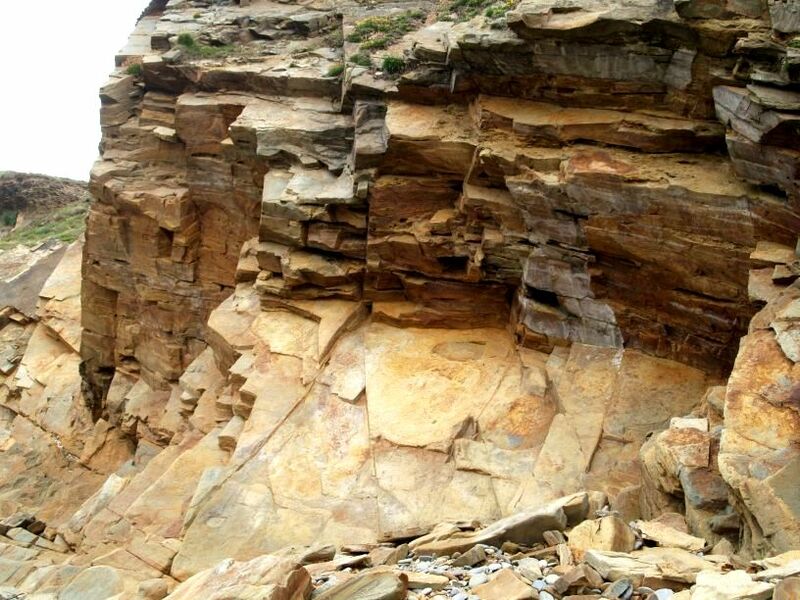 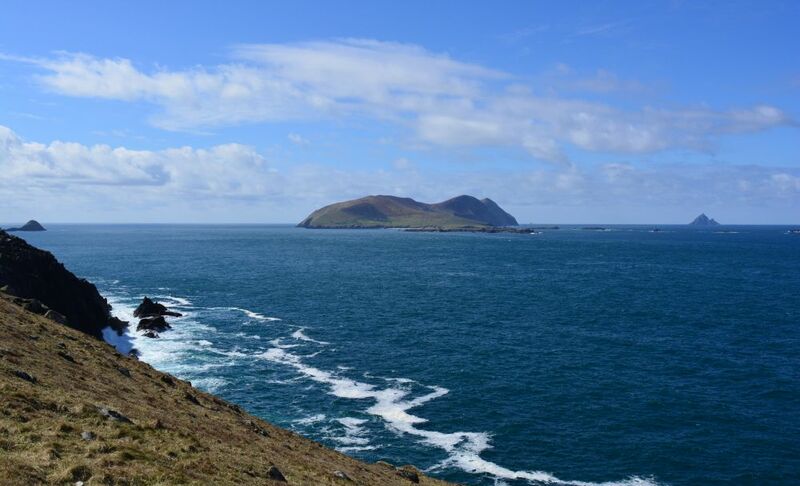 A circular inland and coastal walk from the Great Blasket Island Centre at ? 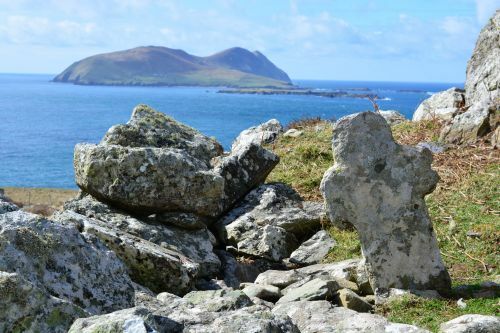 An old weathered Christian cross and the site of an ancient church ? 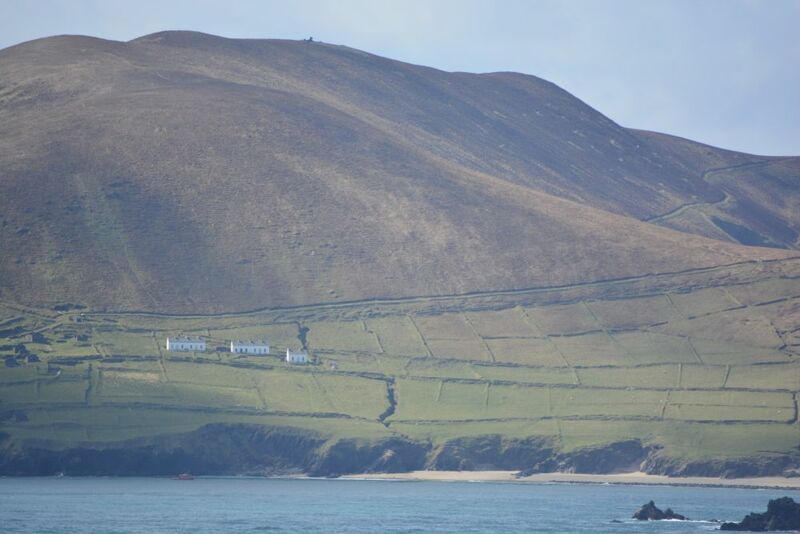 Dunquin village (Dún Chaon) is twelve miles west of Dingle. 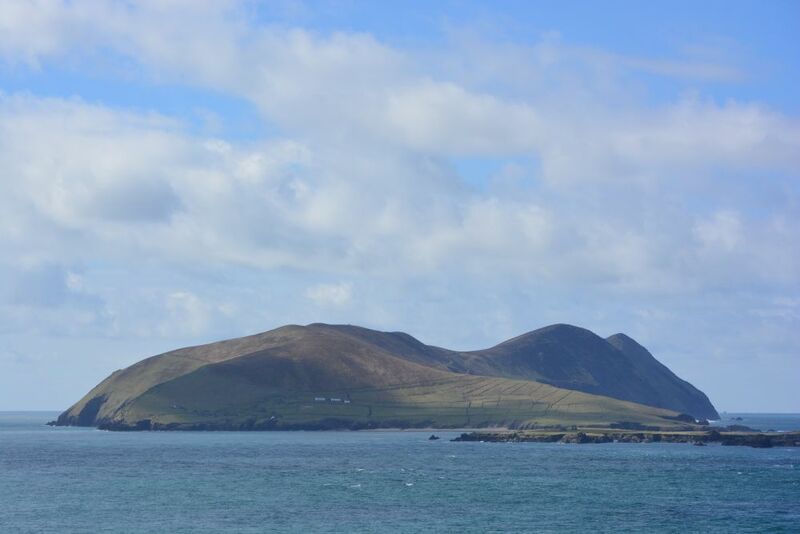 The hills near Dunquin and hedgerows of monbretia. 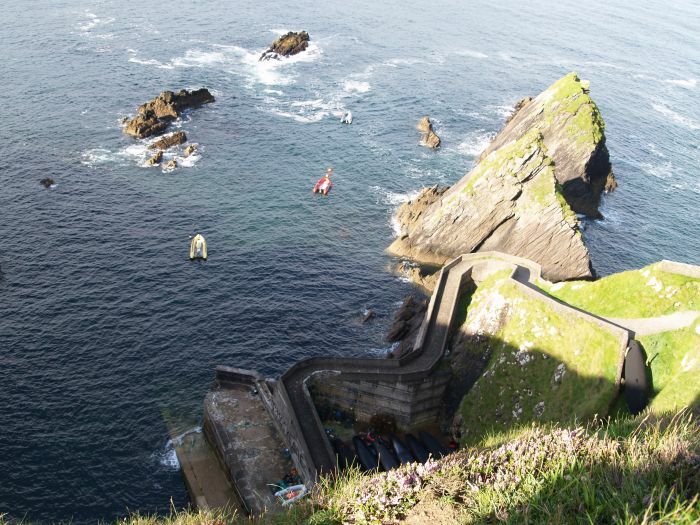 Dunquin harbour and the steep descent to it. 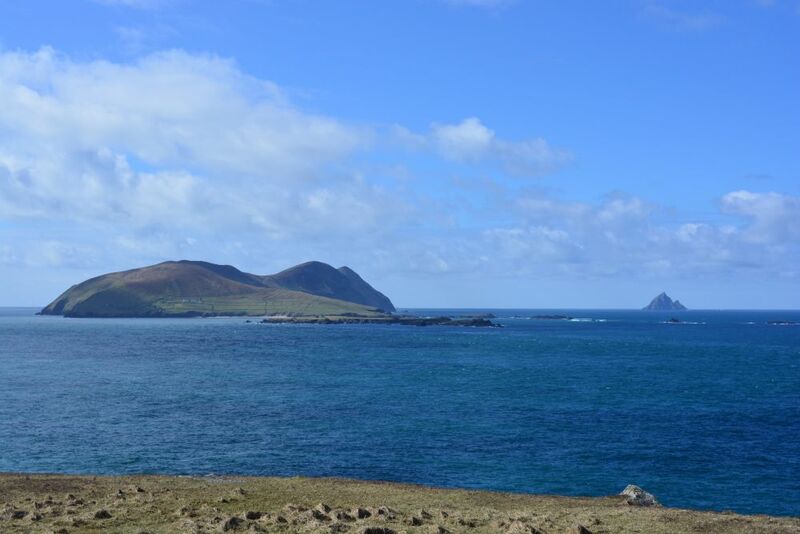 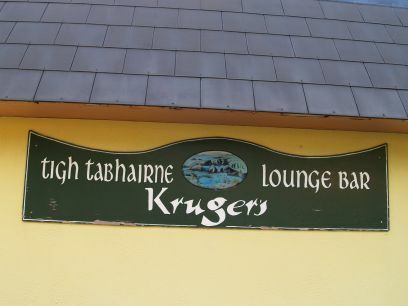 You can get a boat trip out to the Blasket Islands from here, though most boats go from Dingle Harbour now. 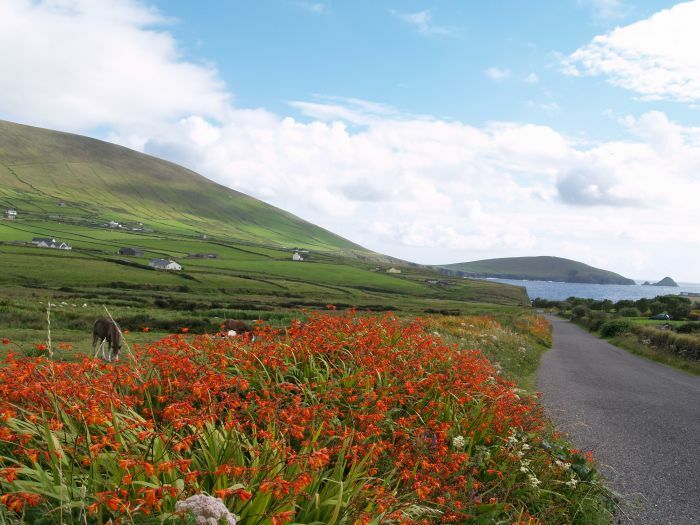 Monbretia lining the road down to the Blasket Islands heritage interpretive centre (Great Blasket Centre, Ionad an Bhlascaoid), with Great Blasket Island (An Bhlascaoid Mór) in the distance on the right. 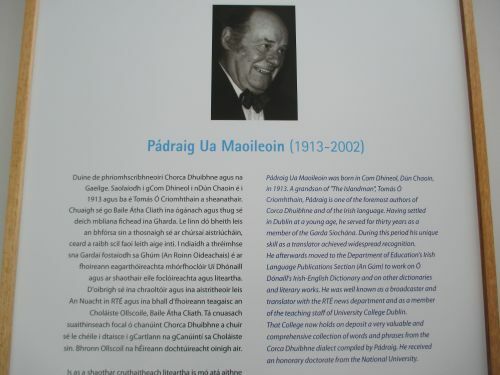 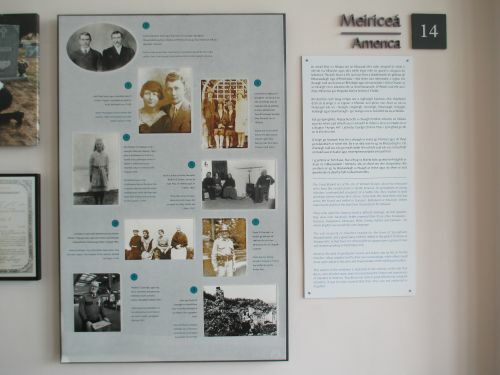 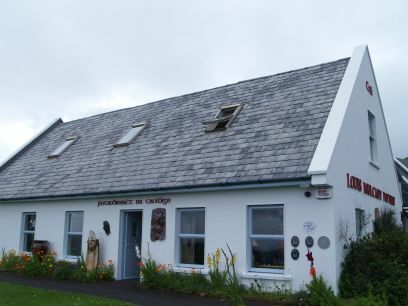 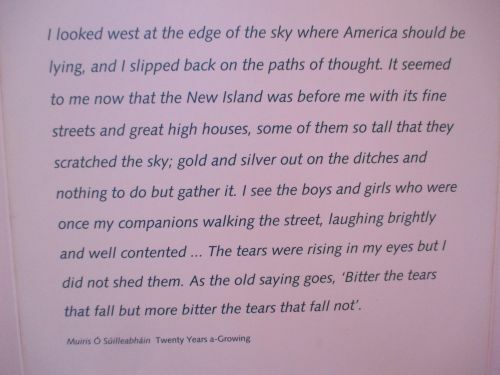 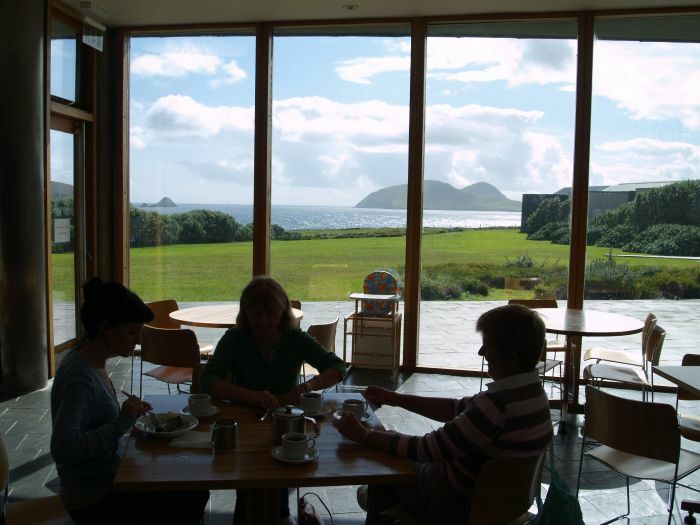 The Great Blasket Island Centre. 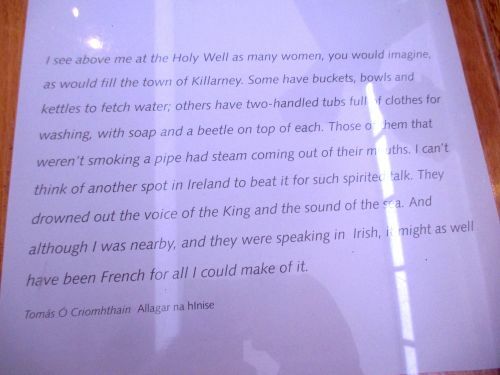 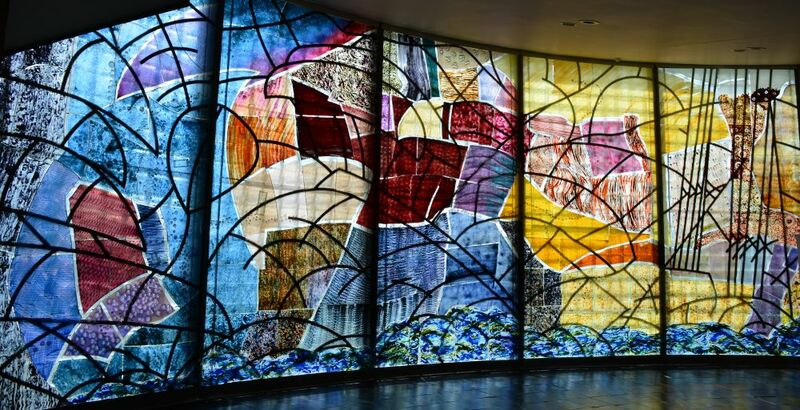 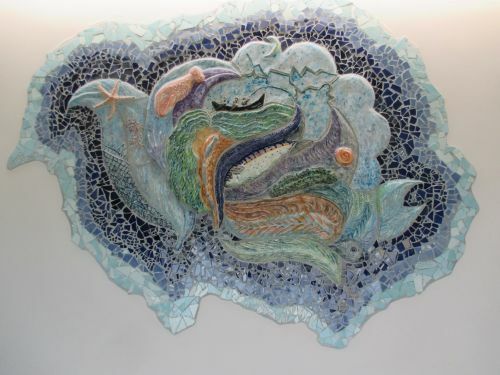 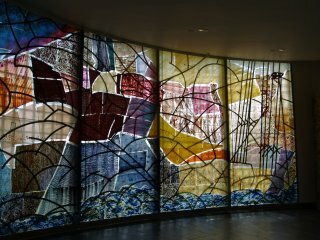 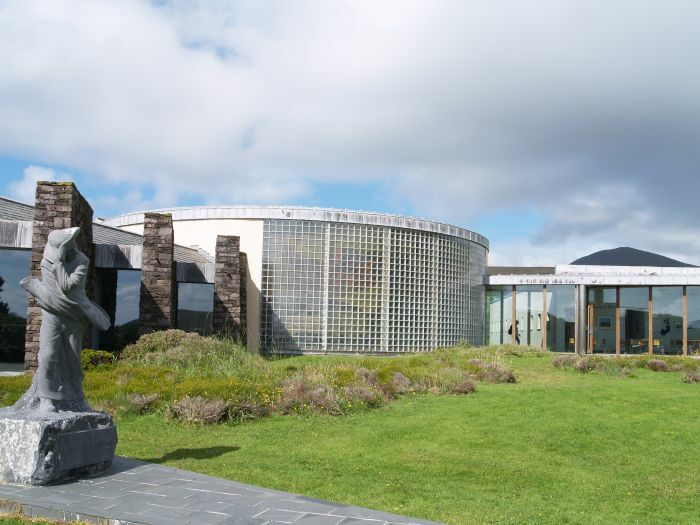 The huge stained glass window in the Great Blasket Island Centre. 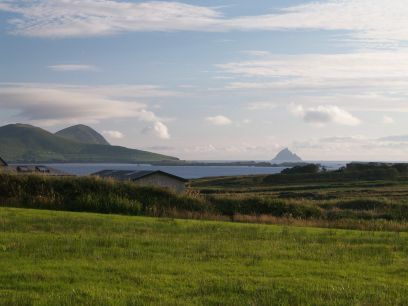 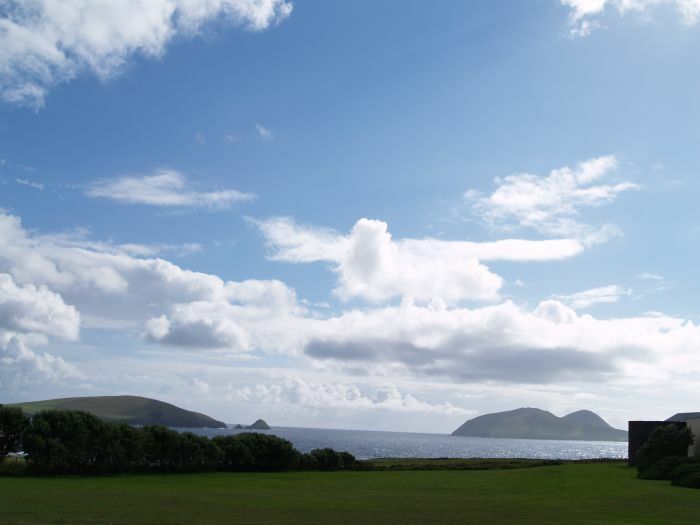 The Blasket Islands viewed from the grounds of the heritage centre which tells the story of people of the Blasket Islands, their history, cultural and literary heritage. 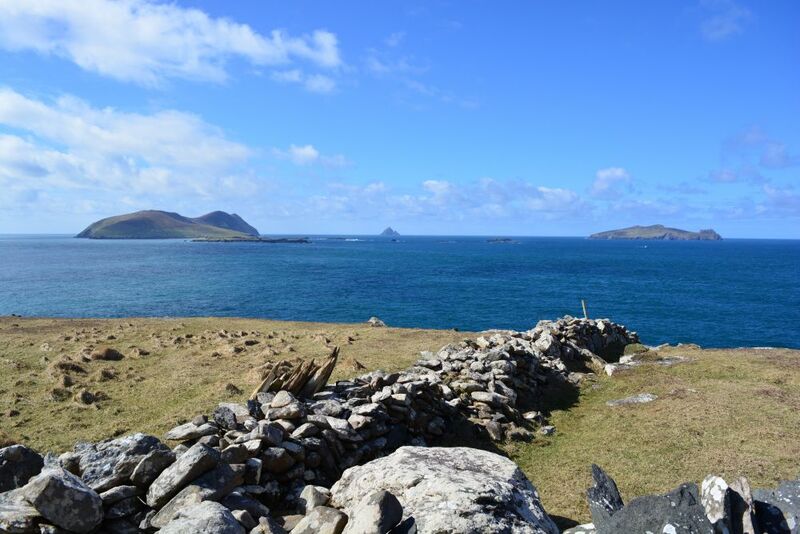 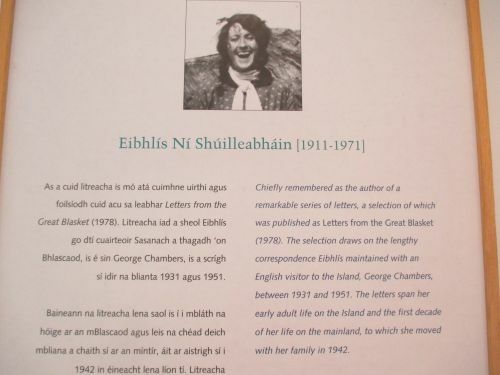 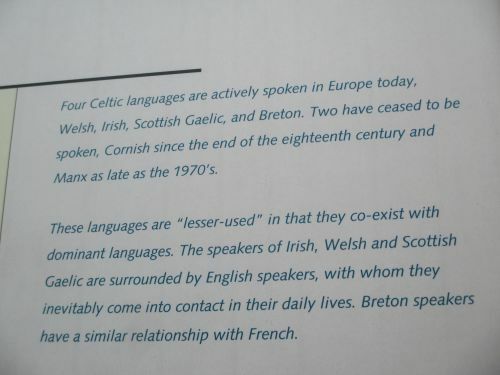 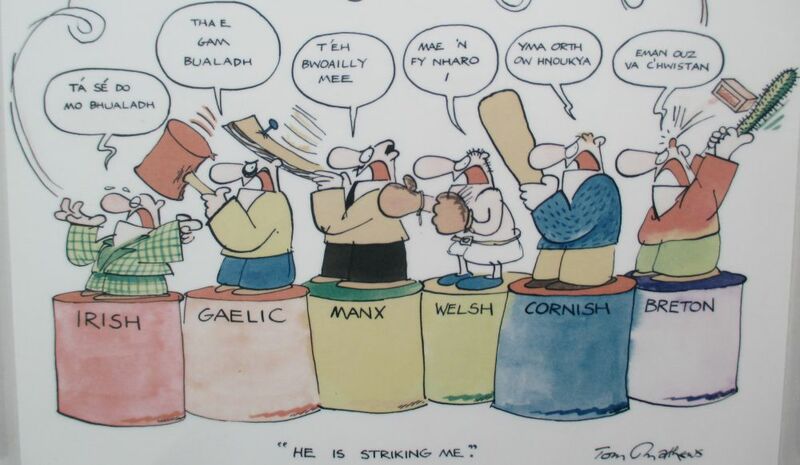 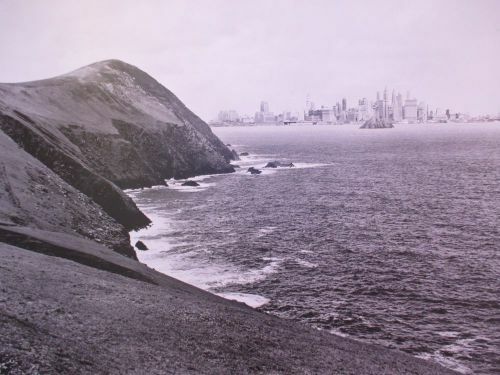 The island community dwindled to 22 in 1953 and so Great Blasket was abandoned. 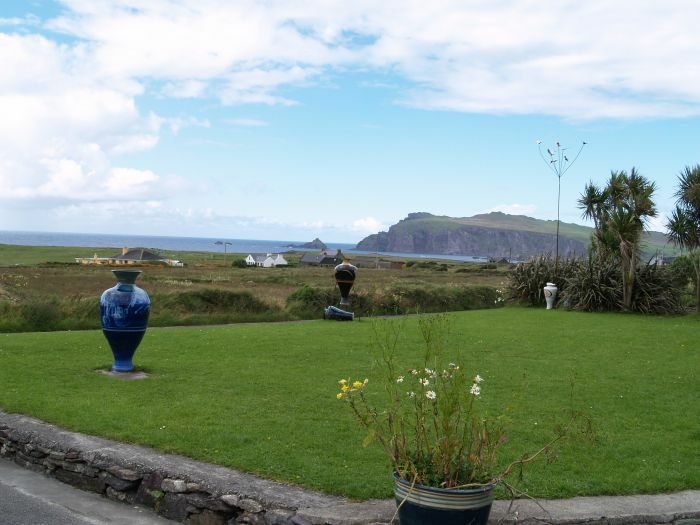 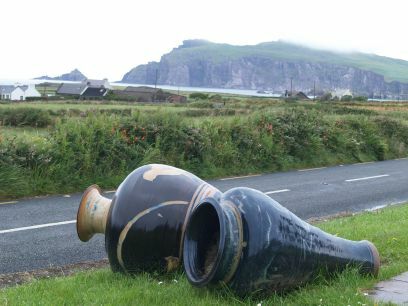 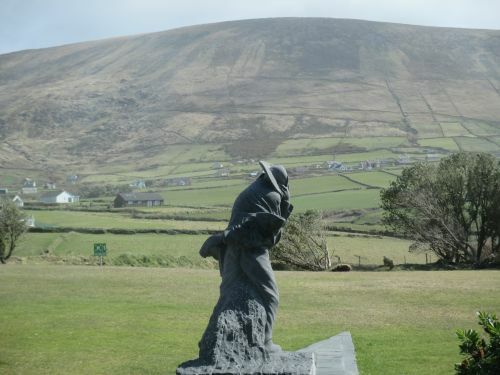 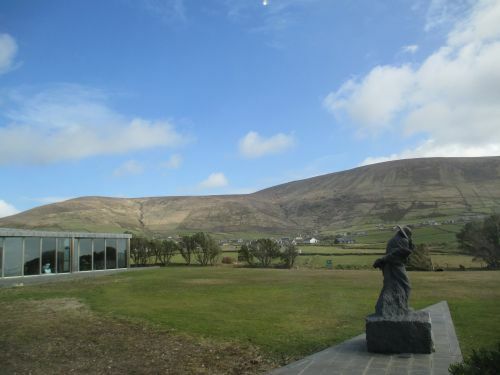 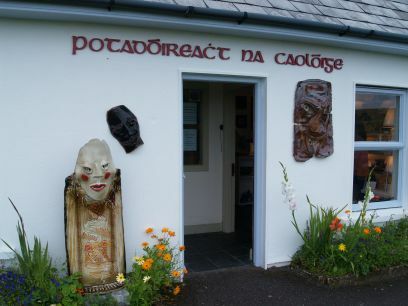 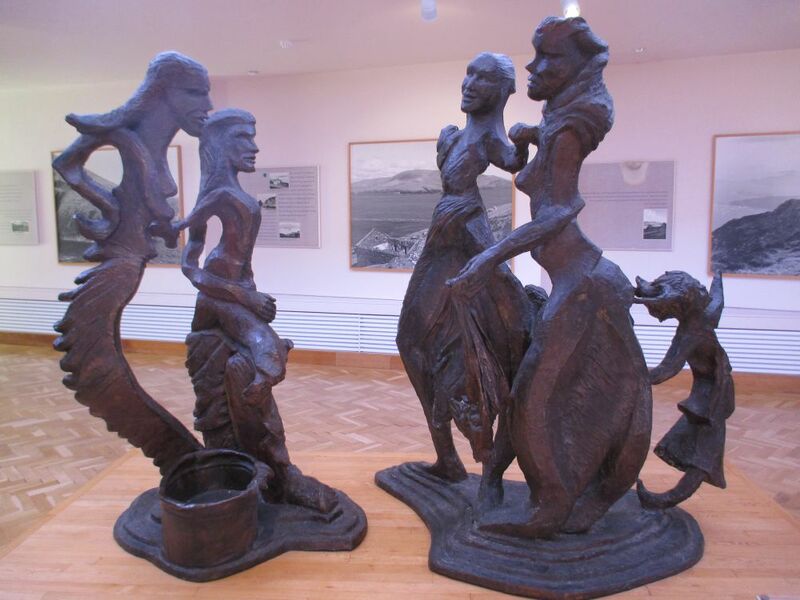 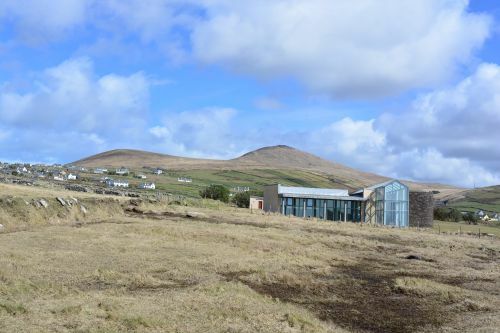 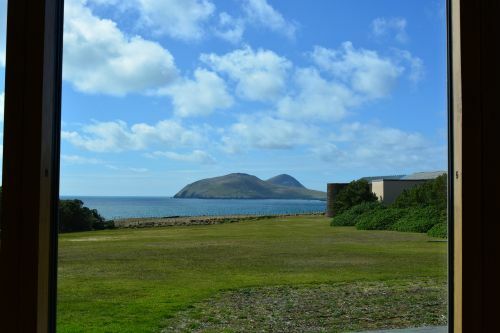 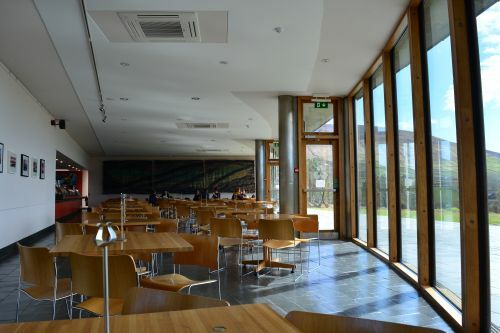 The main buildings of the Great Blasket Centre and the statue of windswept islander. 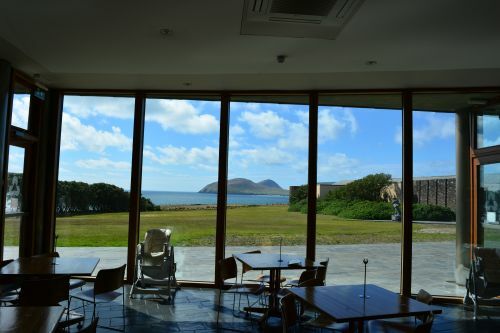 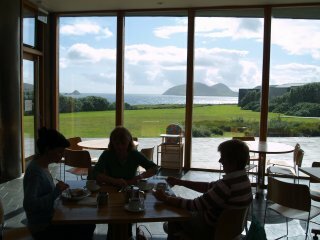 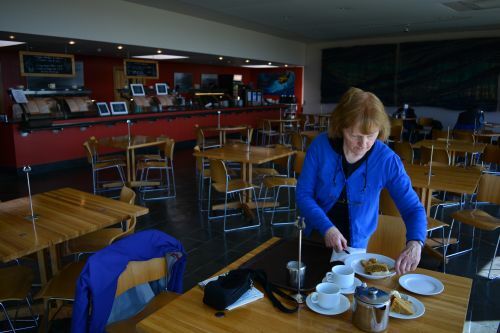 The cafe and view of the Blasket Islands. 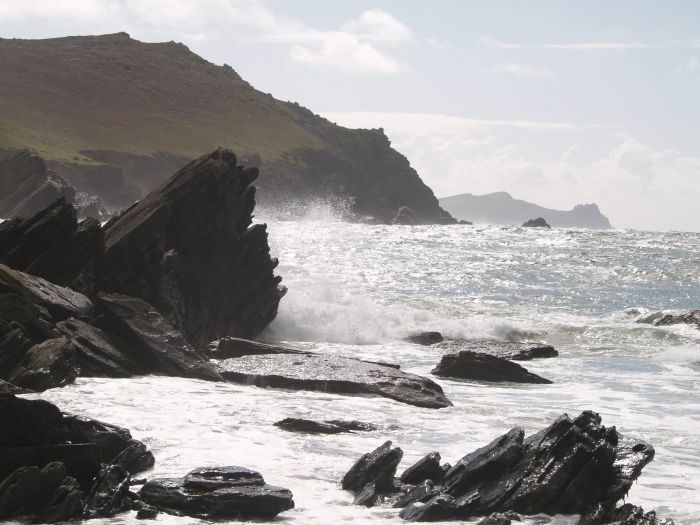 The coast near Dunquin, Clogher Beach, beyond that, Ferriters Cove and the Three Sisters in the distant-right of the picture. 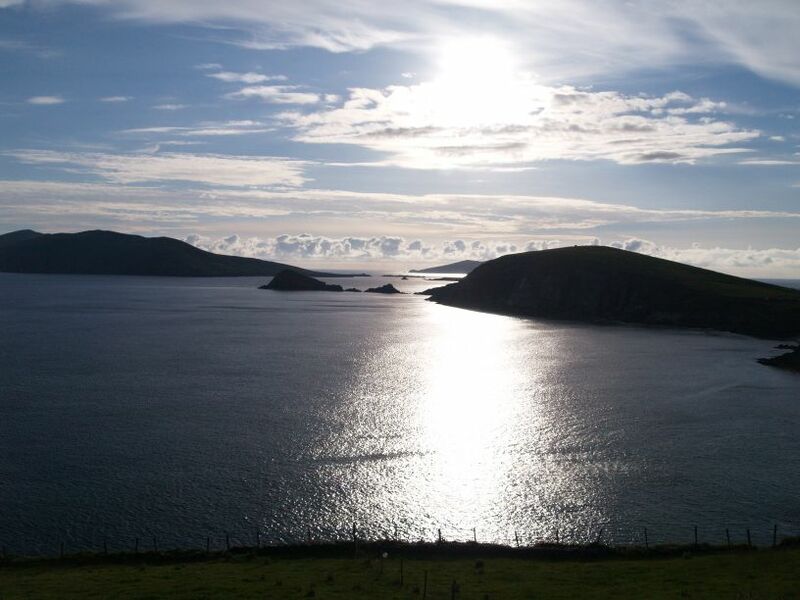 The view near Dunquin looking out to sea to the Blasket Islands. 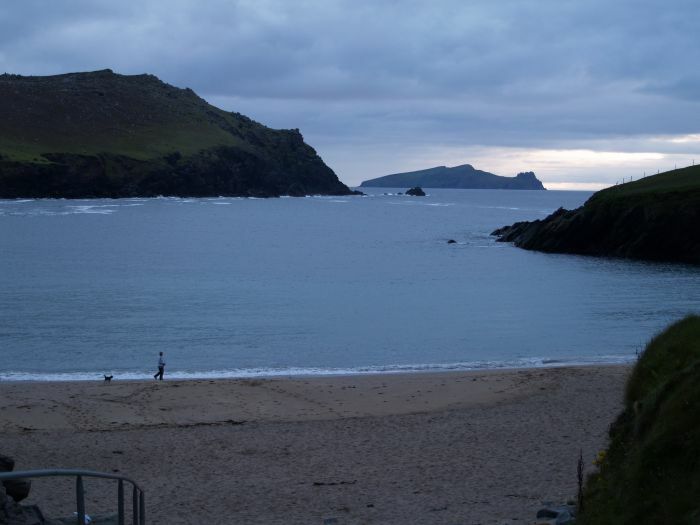 Clogher Beach in the evening with Inishtooskert Island in the distance. 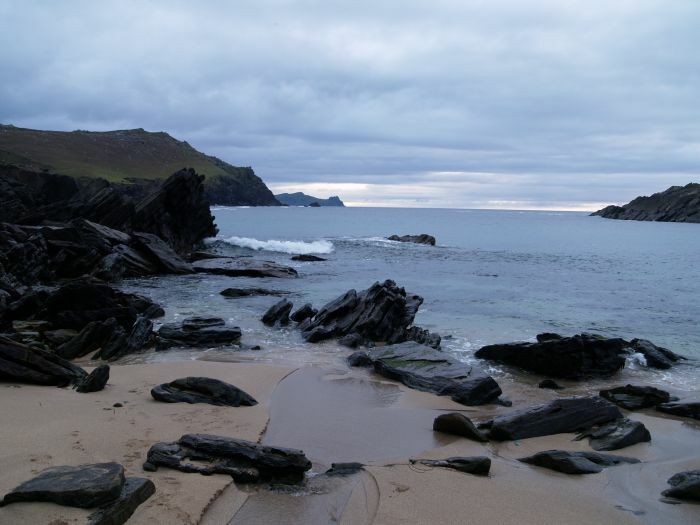 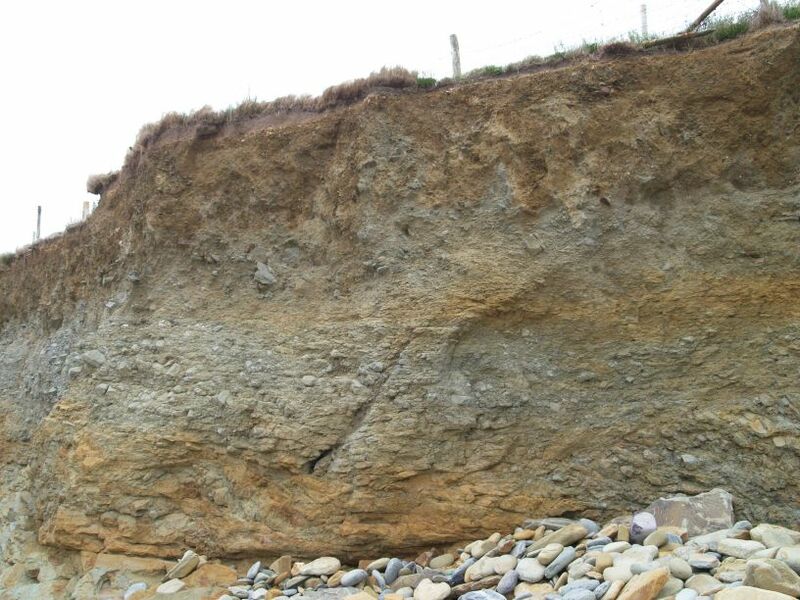 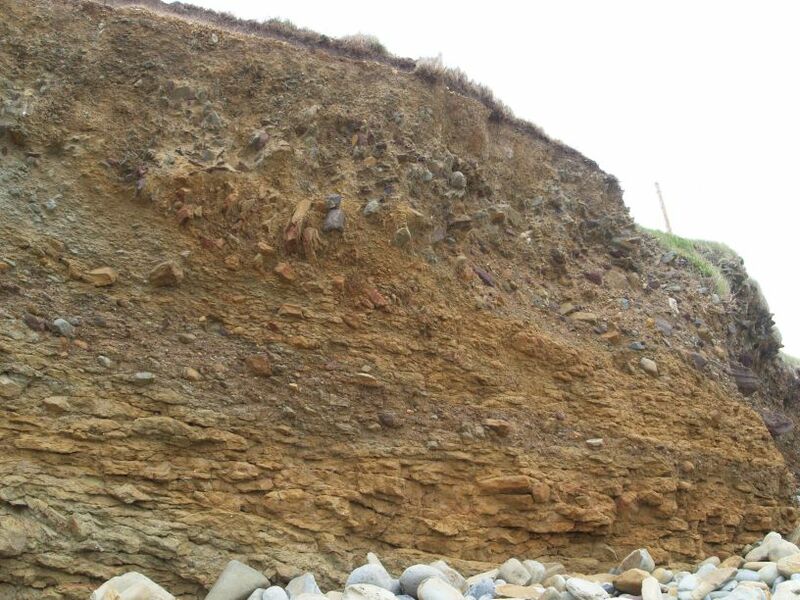 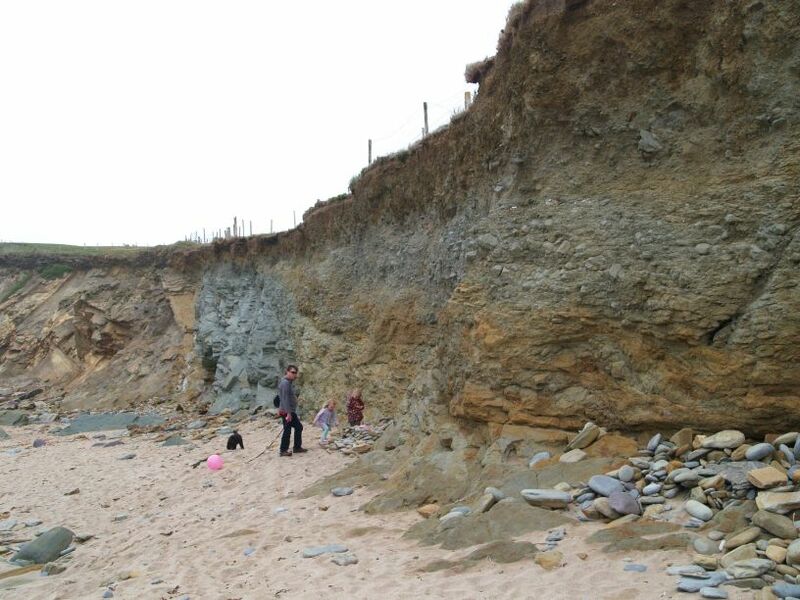 A change in the weather at Clogher Beach. 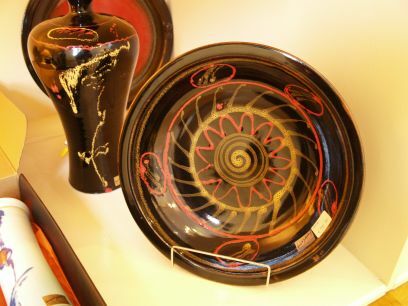 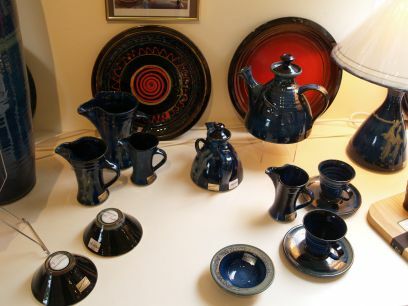 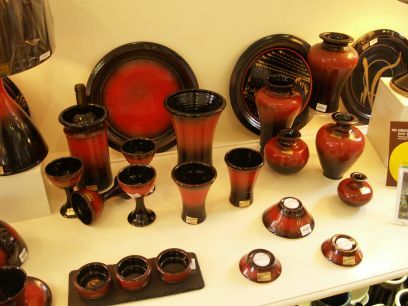 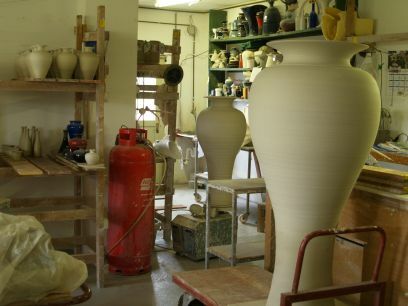 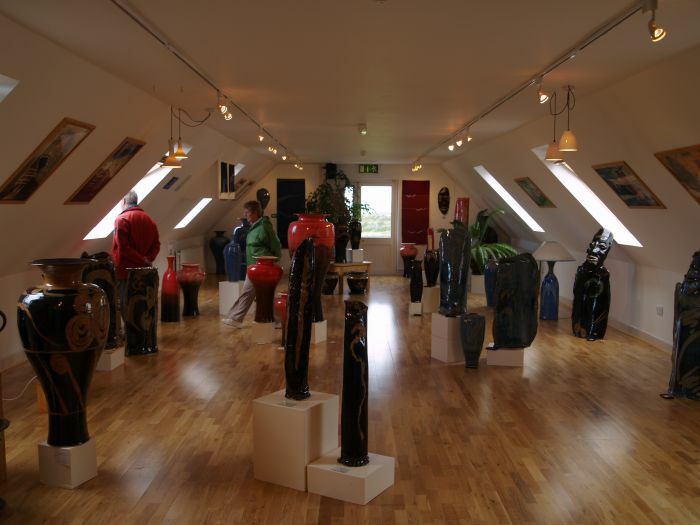 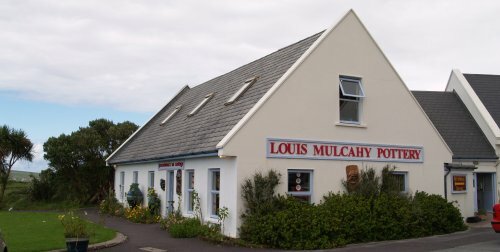 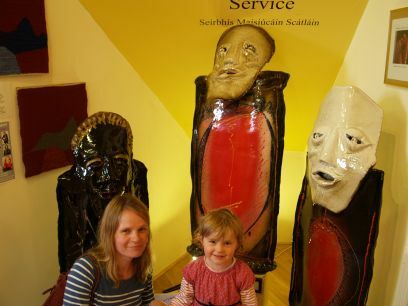 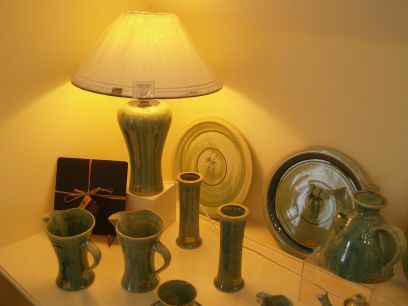 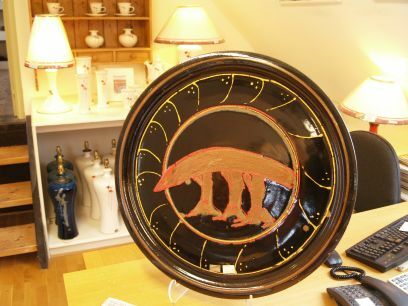 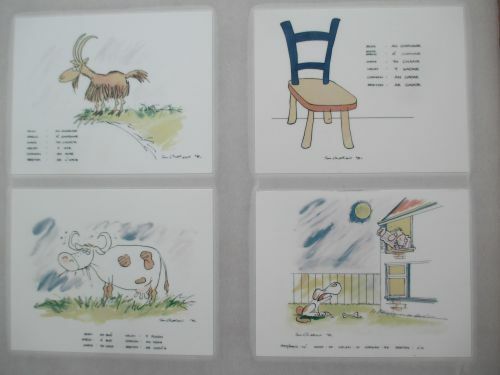 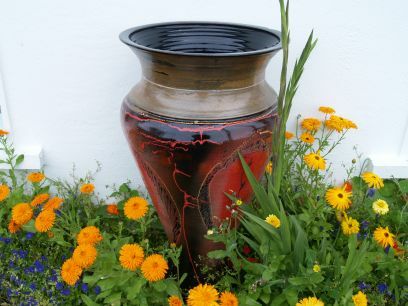 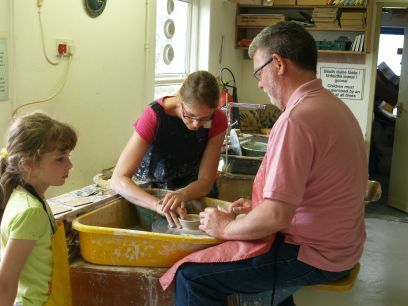 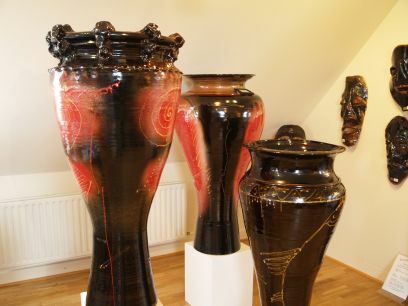 The famous Louis Mulcahy Pottery. 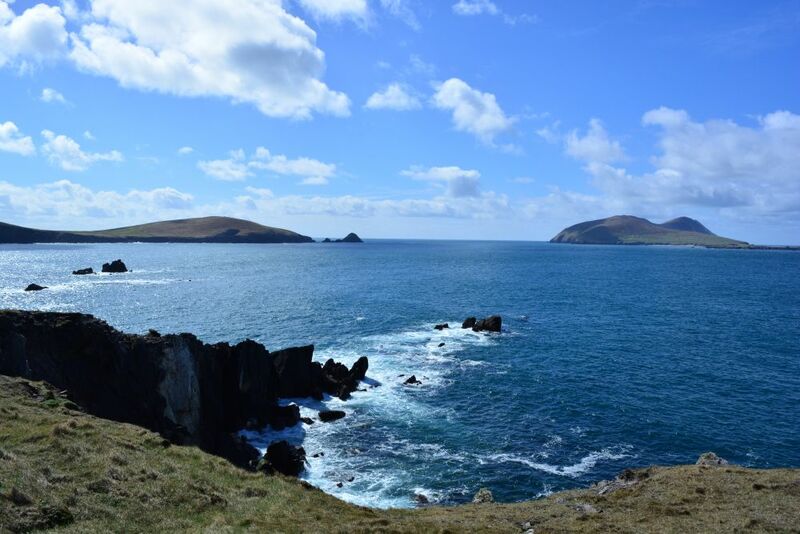 Dunquin, Dingle Peninsula, County Kerry, West of Ireland: The setting of the cafe of the Blasket Island Interpretive Heritage Centre at Dunquin, Co. Kerry, Ireland, has a magnificent view across to the Blasket Islands off the Atlantic Coast of the Dingle Peninsula. 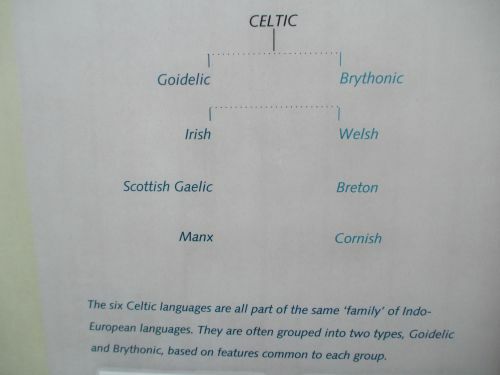 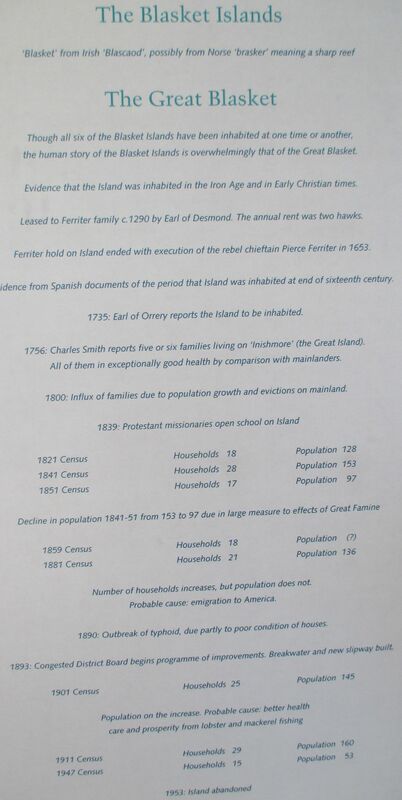 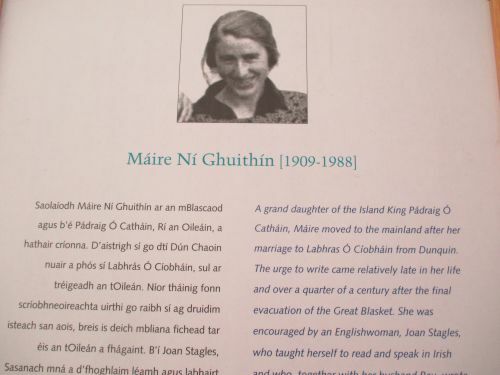 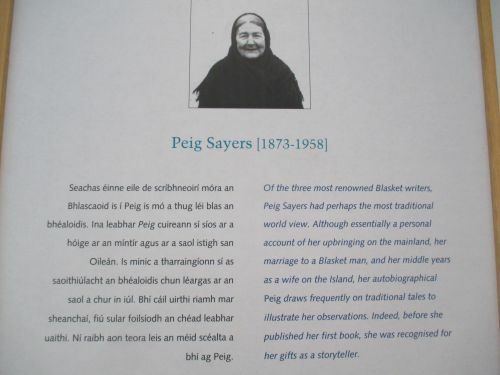 The islands have been officially uninhabited since 1953, but the once thriving small community left a wealth of literature.